Laura and Yon not only helped Mom and I with our luggage when leaving Palazzo they drove us to THEHotel at Mandalay Bay before they went to check in at their next hotel Aria. They did not long haul us! ;) Sadly though we didn't get another chance to see Laura and Yon before they left to return home but will have to wait until later in 2014 to meet again. 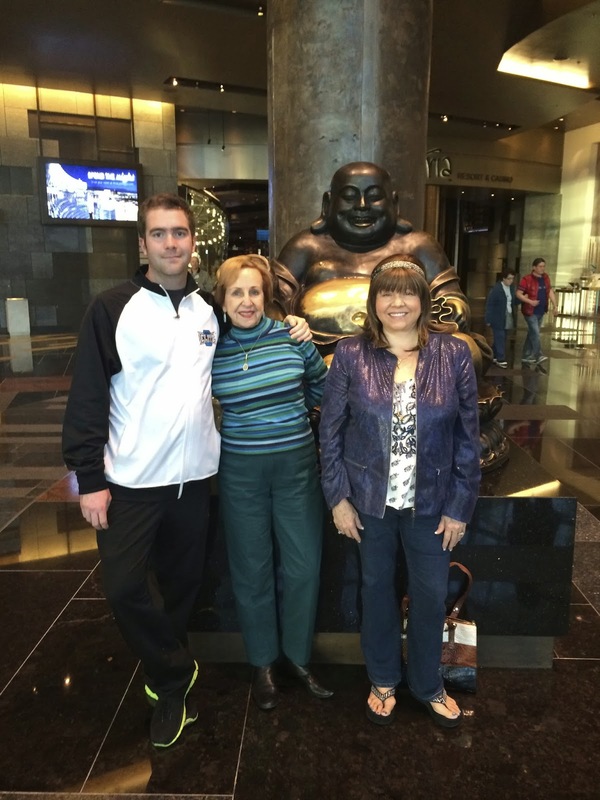 I had VIP check in at THEHotel and they also allowed Mom to check in via the VIP desk. Our request for adjoining rooms was not honored but we did get suites on the same floor. My husband Randy and our son Matt would not arrive until around 6pm so I had a few hours to gamble after unpacking and Mom decided to rest up for a bit. I was up a couple thousand or so from my wins at Palazzo but nervous about giving it all back since one of our Christmas presents to our son was $500 of gambling money and of course I didn't know if my husband and I would have any luck during the next three days, as the past year or so we had mainly lost at Mandalay Bay. 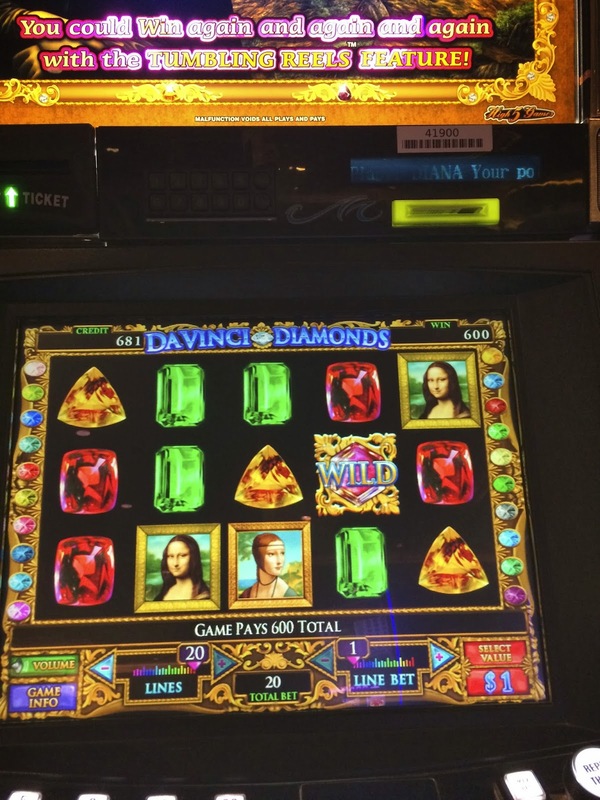 After getting my lowly amount of $200.00 free play from the players club desk I started out with my favorite $1 Davinci Diamonds slot since it was nearby. Davinci took my free play and some of my bankroll so I decided to move on to the penny slots. 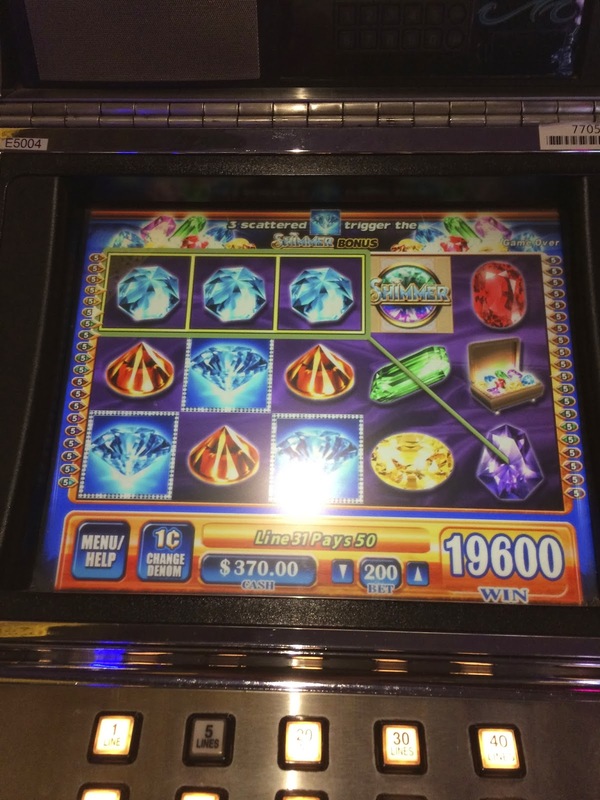 I tried playing the new Avatar and Iron Man slots and lost a couple hundred on them. 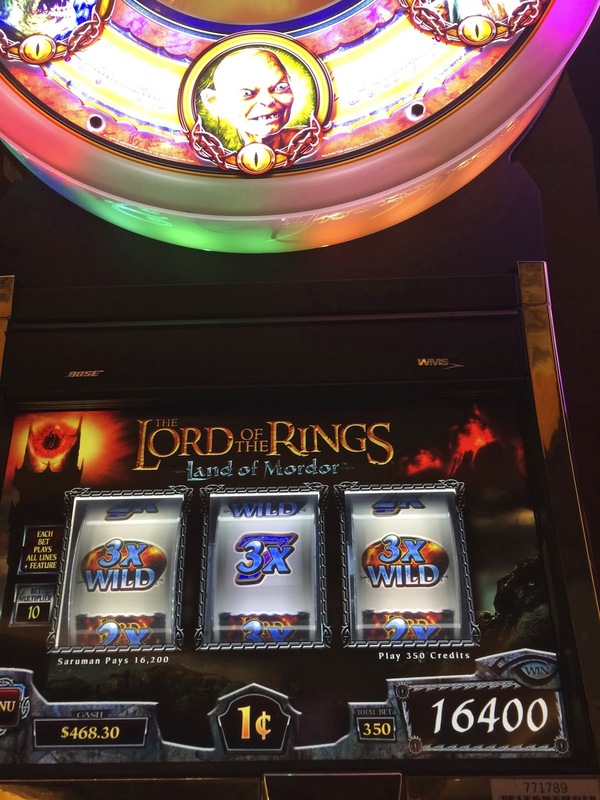 Tried some old favorites like Wolf Run and lost more money and was getting a bit worried that changing casinos had changed my luck too! 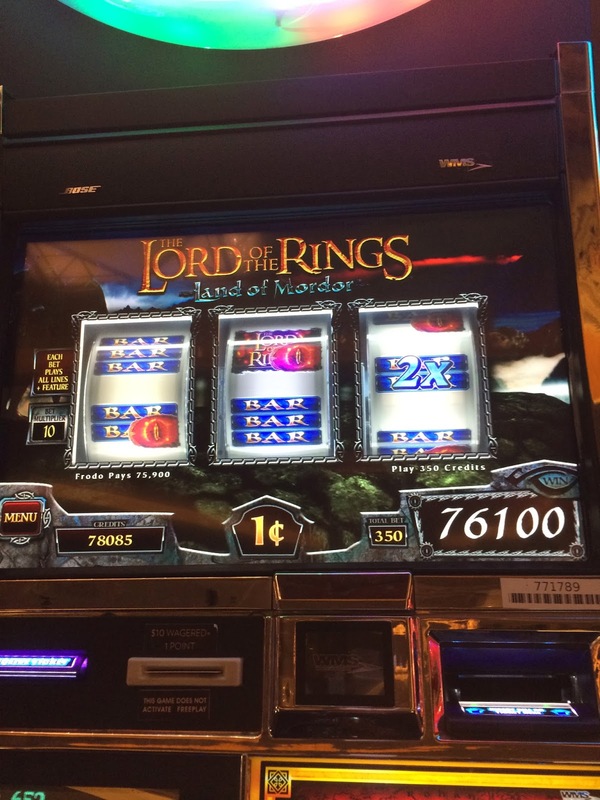 Earlier my favorite Lord of the Rings slot at Mandalay Bay had people playing it but it was finally free and I put a hundred in it and starting max betting. 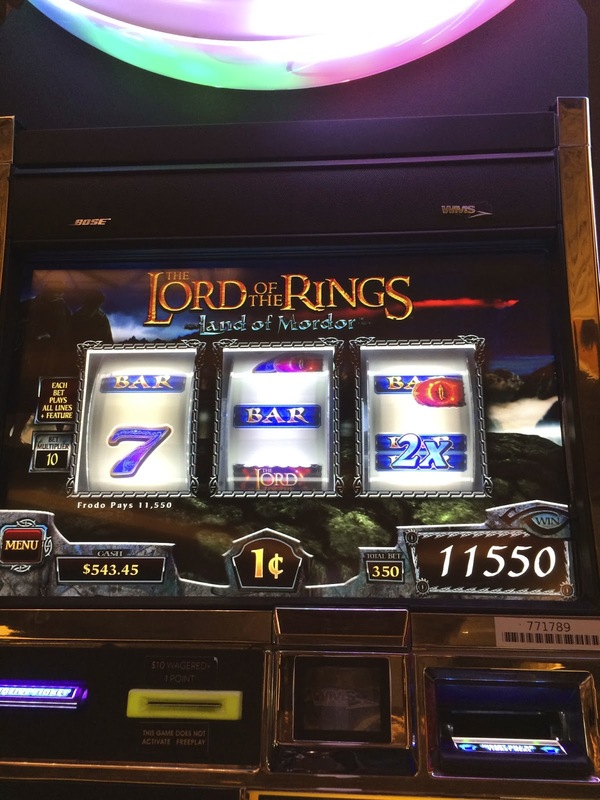 I hit a Frodo bonus on it pretty quickly and had a surprise win at the end of it of $761.00. Of course if you watch the bonus of it below I was greedy and wanted even more! Whew! I had recovered my earlier losses and was now ahead for the day at Mandalay Bay. 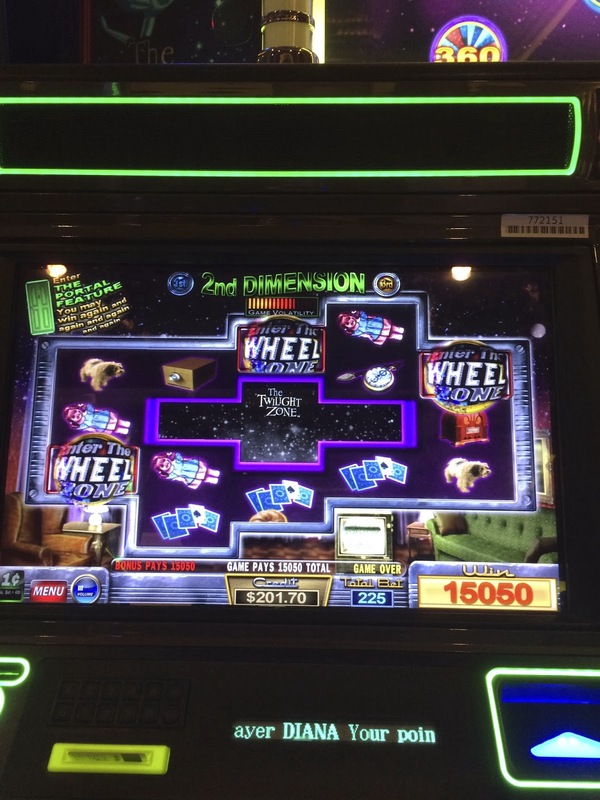 I played a few more slots like Twilight Zone and started losing again! Fortunately I didn't lose too much before my husband and son arrived and I took them to the room where they unpacked before dinner. I really like the suites at THEHotel at Mandalay Bay, even though these days they are showing their age before they are remodel them due to Delano taking over THEHotel later this year. They are two room suites with a living room that makes it convenient when traveling with our son as he can sleep in there on a roll away and also in addition to a huge master bath the suites have a half bath that is handy when sharing three to a suite. After Randy and Matt had unpacked we met up with Mom at her room and walked over to Luxor. 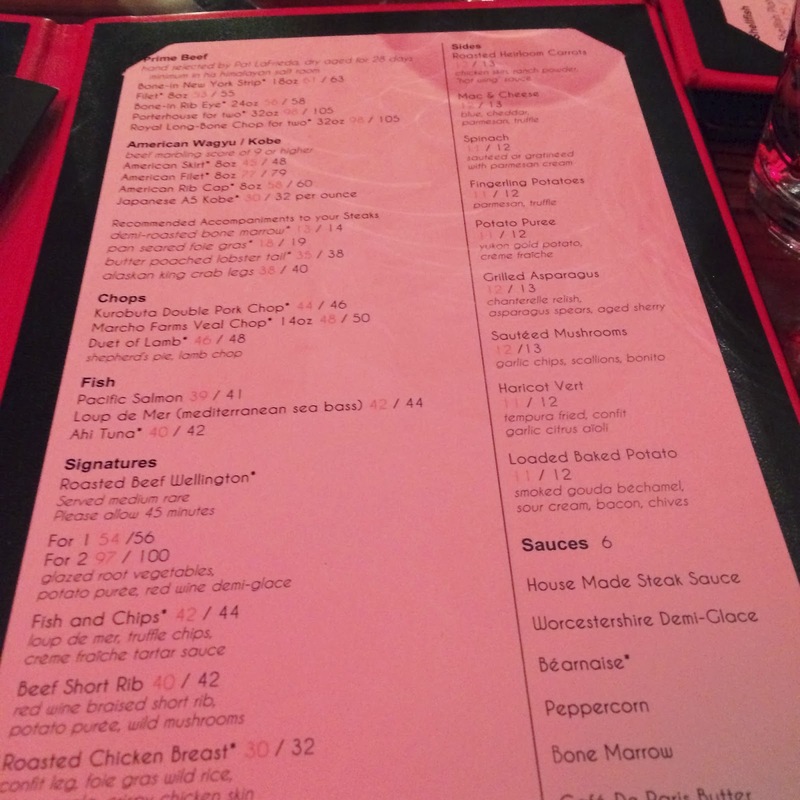 In addition to the $300 resort credit I had with my offer I had a myvegas coupon good for $75.00 off a $150.00 or more bill at Tender Steak and Seafood. Randy and I used to love this restaurant which has had an old Vegas feel to it and the same menu for years, even though the name was changed a couple years ago. However last time I ate here with my friend Terri some of the food was a bit off so I was hoping they once again had their act together and we would enjoy our dinner. The bread was nice and my shrimp cocktail with coconut curry greek yogurt sauce and seaweed salad was fresh and firm. I didn't really care for the coconut yogurt sauce and I like coconut, I ended up just using the cocktail sauce. As you can see there wasn't much seaweed salad but that was fine with me! My husband liked his baby iceberg salad but fell in love with my son's chili appetizer. Mom had the arugula and watercress salad with spiced almonds, goat cheddar cheese and lemon dressing. Mom enjoyed the salad but said she couldn't locate the cheese in it. 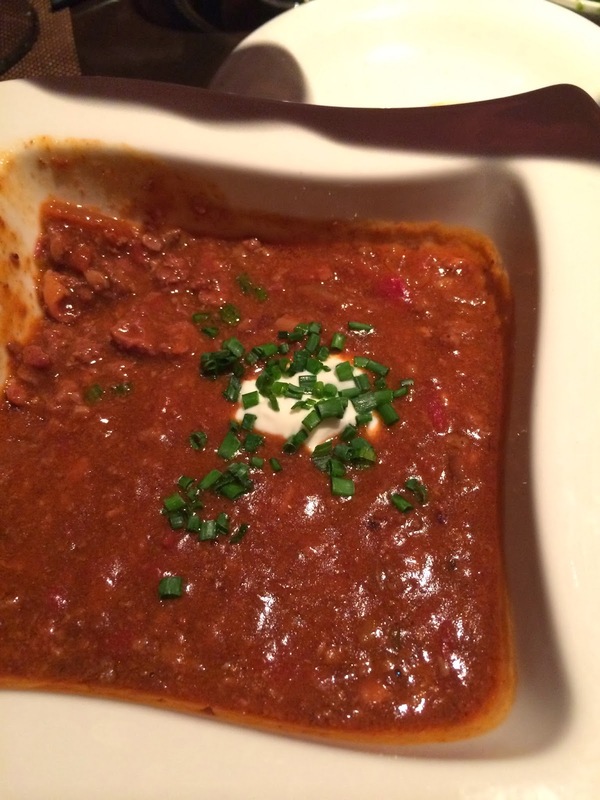 The stand out appetizer and dish of the evening was my son's wagyu Kobe-style beef chili with smoked bacon and creme fraiche. I'm not much of a chili eater but this was outstanding! It was so good we ordered another one for all of us to share. I would return to Tender just to order this chili. Try it, and thank me later! Below is my scallops they were a bit too seared and dried out on top but were fine. Actually after that chili I just wanted more chili and to heck with the scallops. 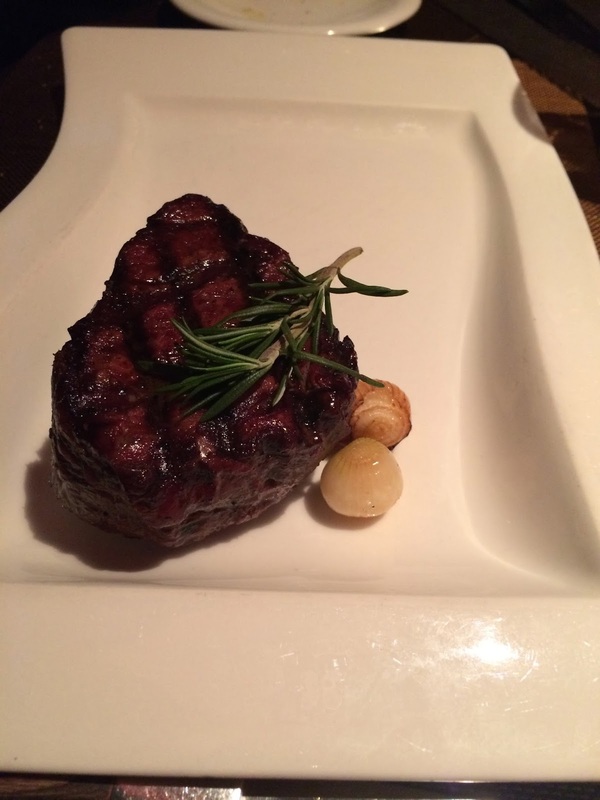 My husband had the 12 oz filet with green peppercorn sauce. I had a taste of it and it was delicious. My son had the New Zealand 14 oz ribeye below and said it was great. Mom, just had appetizers, veggies and desserts. 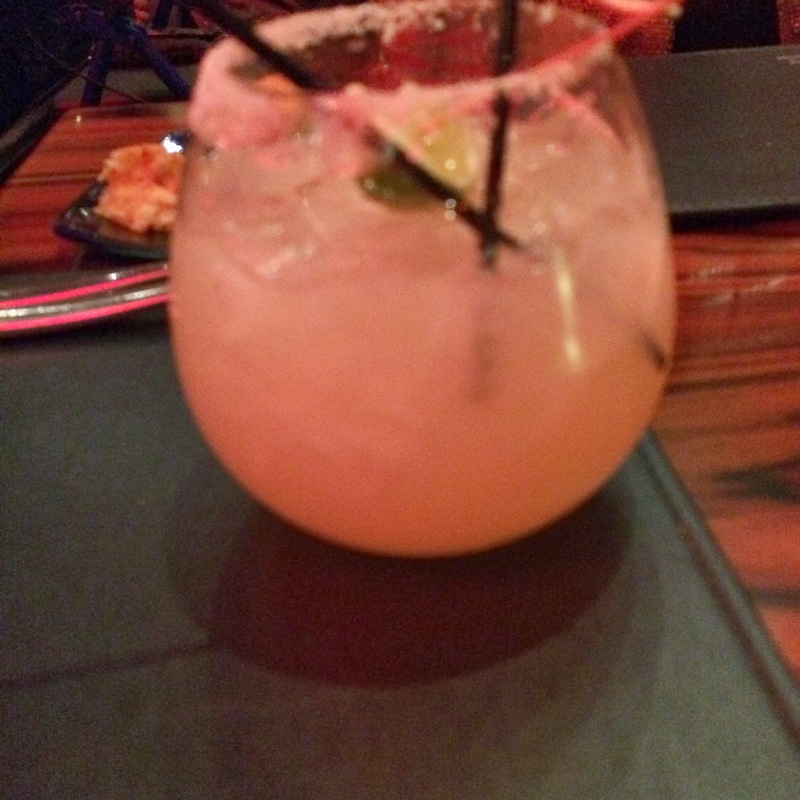 We also had some nice spicy fire away cocktails and Margarita Fresco's to drink. 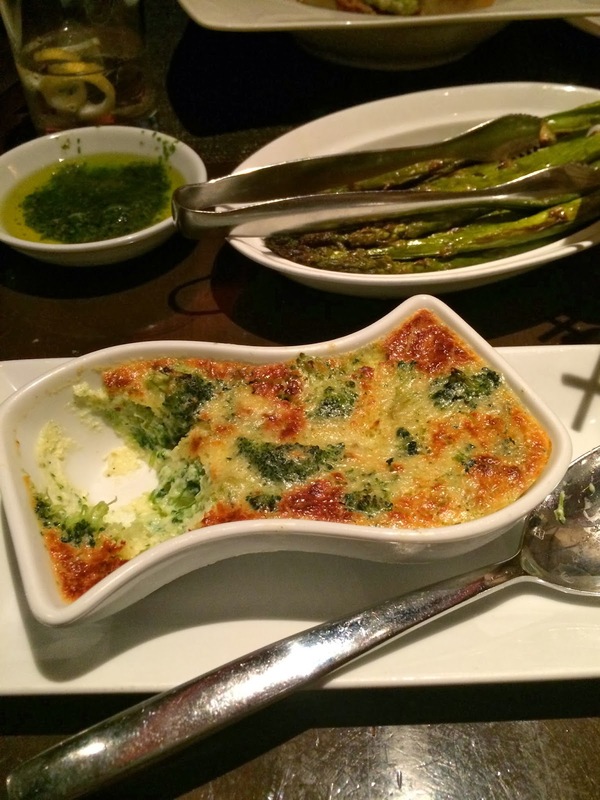 While the grilled asparagus was good another stand out dish was the broccoli quiche which is a new addition to their menu. All of us fought for this veggie side, it was yummy! 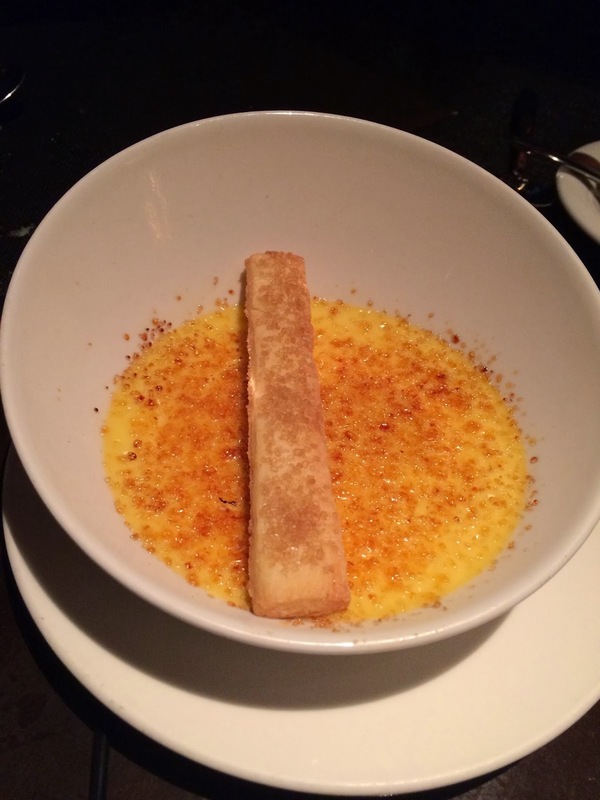 Creme Bulee is always good, but the more then S-More dessert was the best! Even without a myvegas coupon I would return to Tender Steakhouse again as long as the chili and that broccoli quiche remains on the menu. 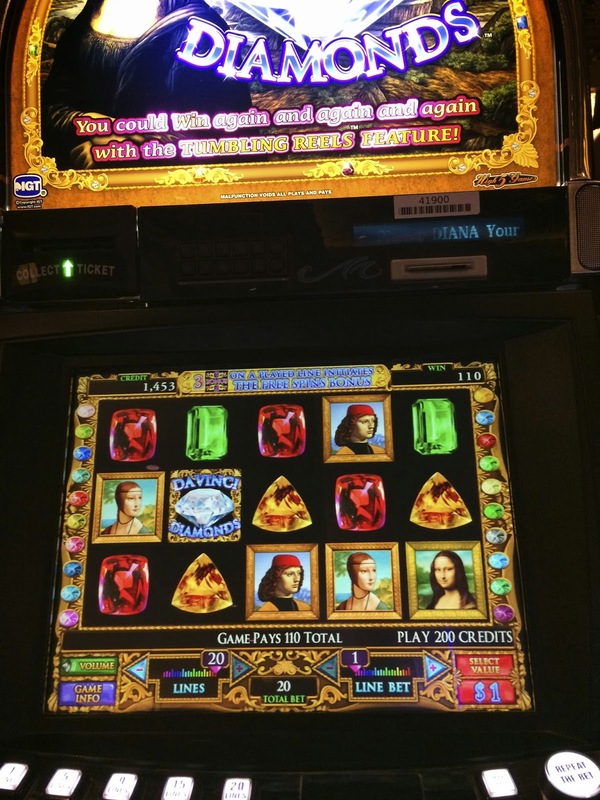 After dinner all of us played a few slots at Luxor. 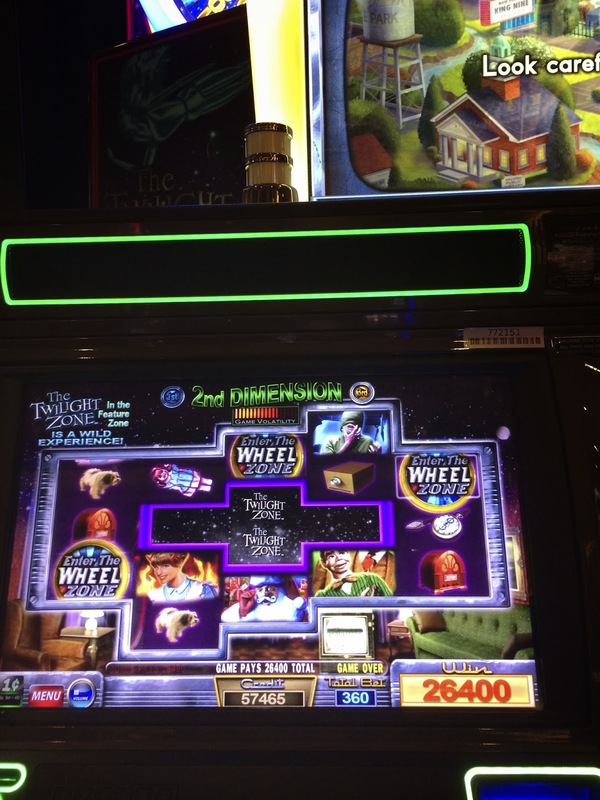 They had one of my favorites the Beverly Hillbillies slot and I had fun with a few good hits and a couple minor bonuses. 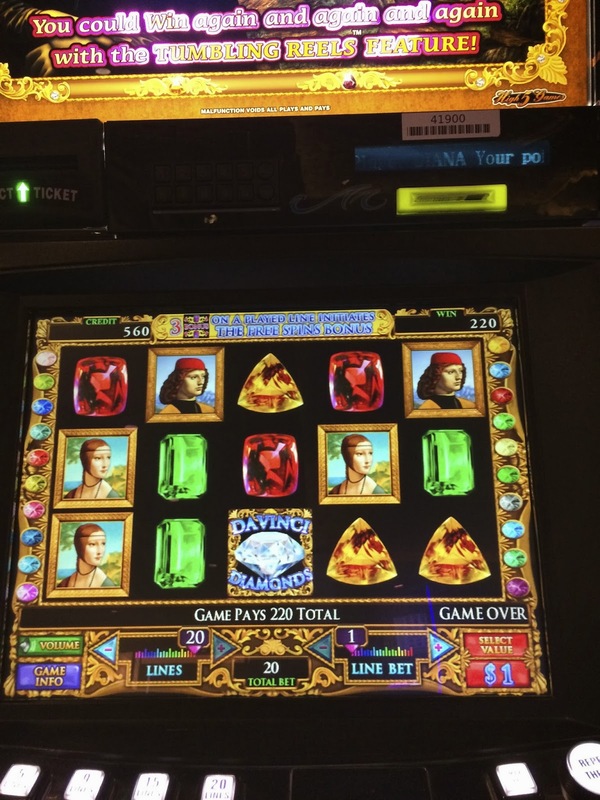 My husband and I played Iron Man side by side at Luxor for a while and later at Mandalay Bay. 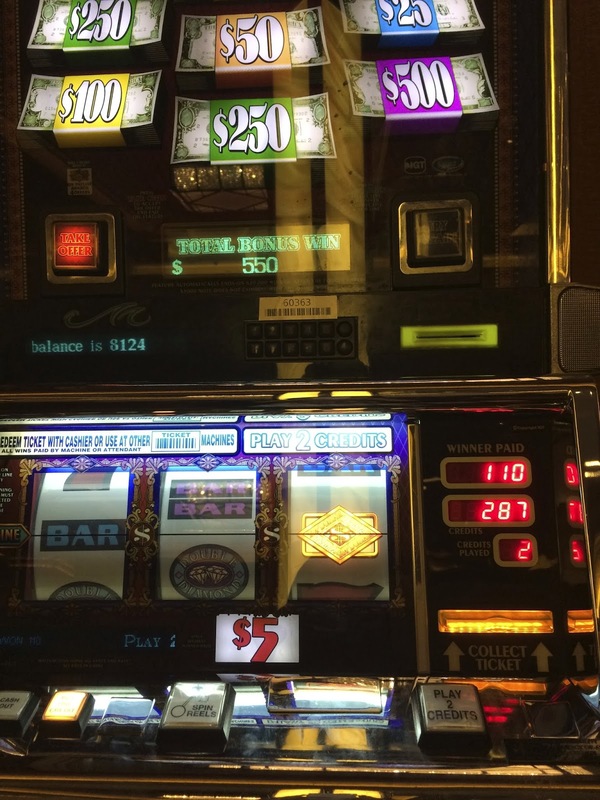 I like this slot and I have a friend who has had a hand pay on the Jericho Missile bonus, but Randy and I couldn't do much with it this trip. 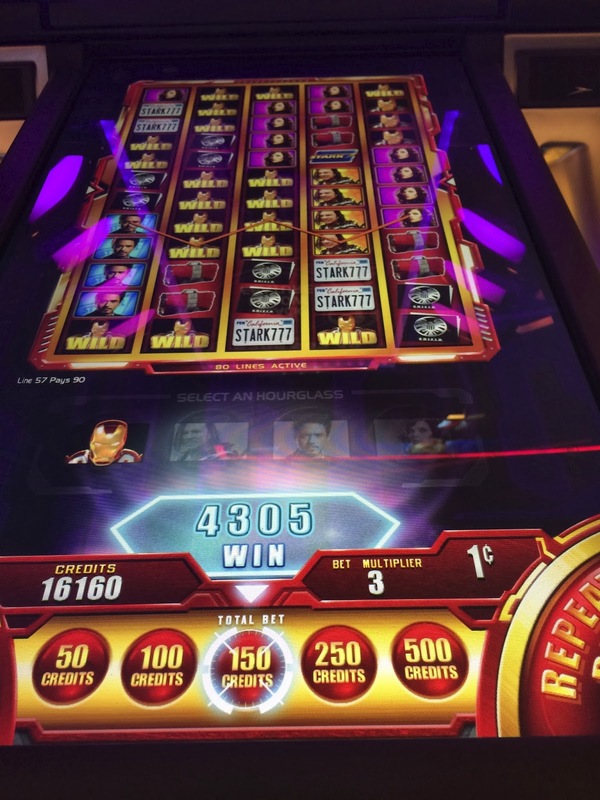 If you are curious about the play and some of the bonuses on Iron Man here's a video with a few bonuses and some live play. I call this video, Ironman and Tony Stark did not save my bank roll! After Ironman I tried to get something going on Luxor's Super Monopoly slot but other then this hit nothing good was happening. 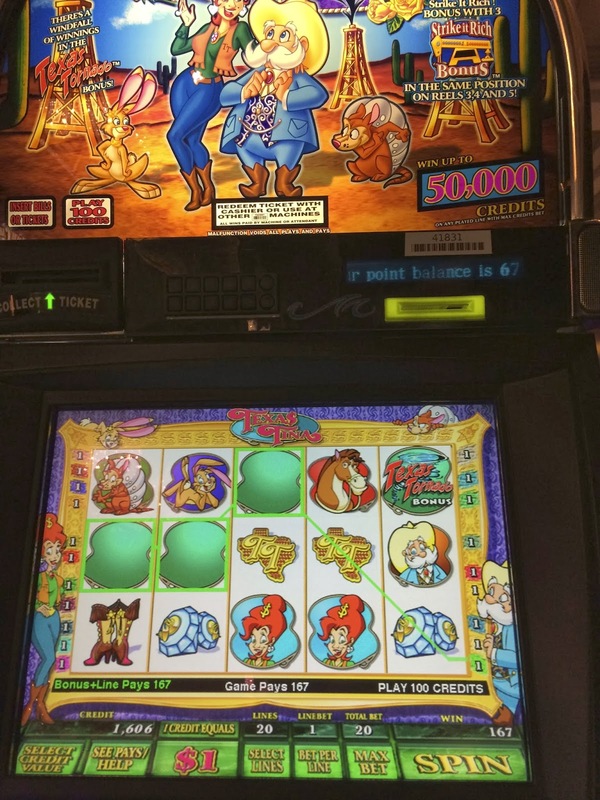 My son in the meantime was losing money on the electronic craps machine, Randy had some luck with Avatar briefly and Mom was holding her own with Willy Wonka! After we left Luxor and returned to Mandalay Bay my son headed off to his next losing session on the electronic craps machine and Mom was tired and decided to go back to her room to watch TV. 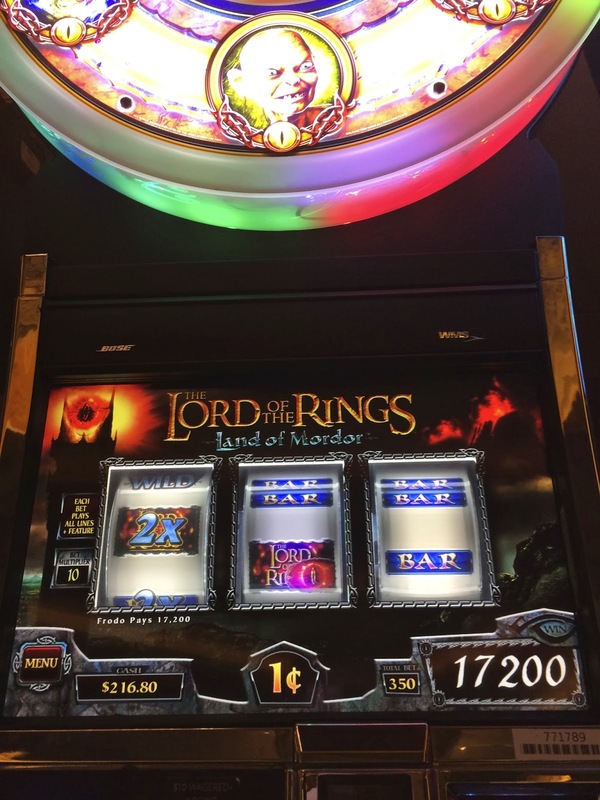 Randy headed off to play Avatar at MB since he had some luck at Luxor and I returned to the Lord of the Rings Slot that I had my big bonus on earlier in the day. 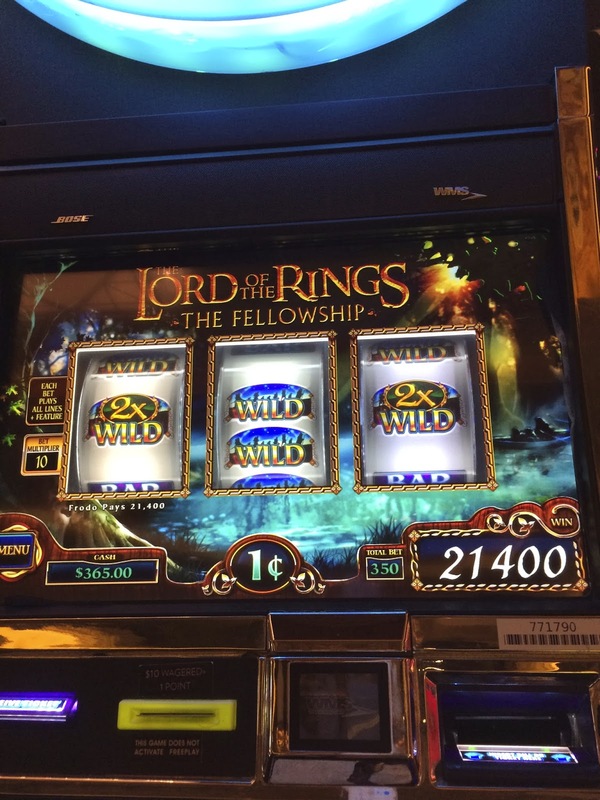 Lord of the Rings gave me lots of fun with bonuses and I ended up grinding out a few hundred via the bonuses hitting often. 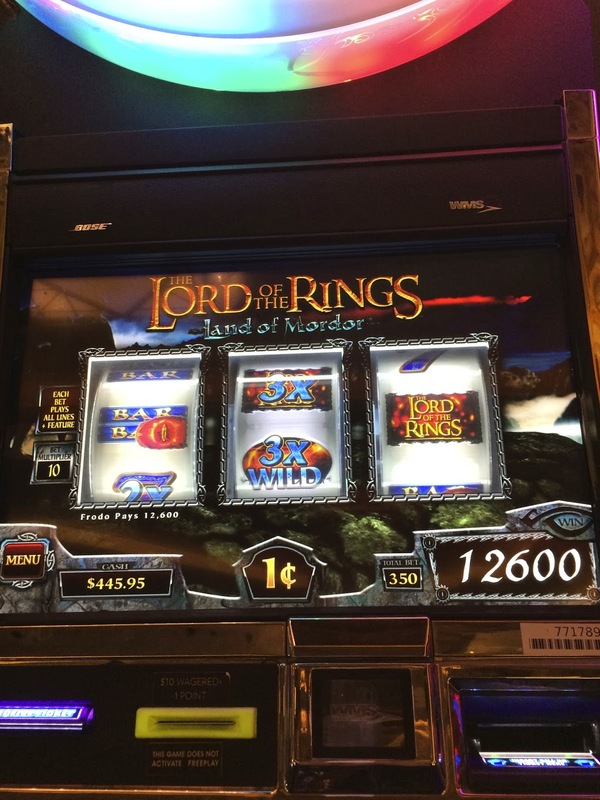 If you like Lord of the Rings, I have some of the above bonuses in this video. 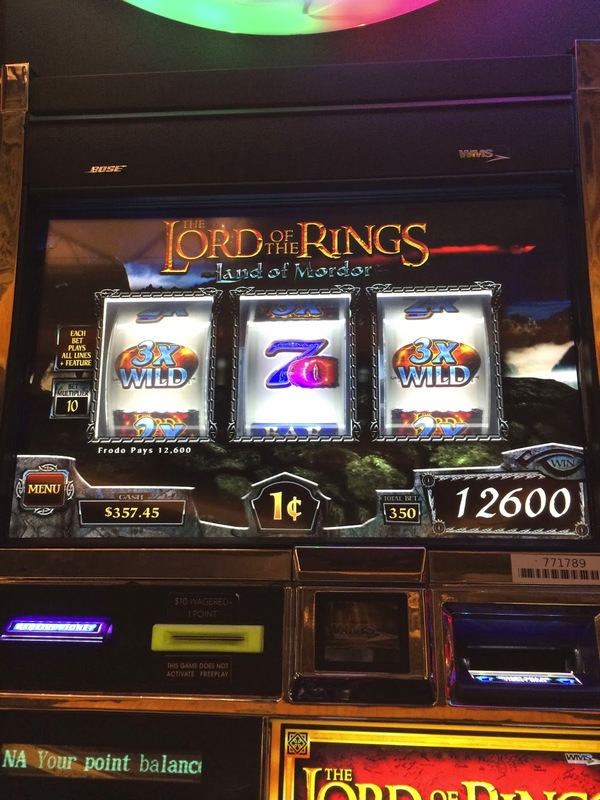 When my luck dried up on Lord of the Rings and my husband had given up on Avatar, we played Twilight Zone together and had some fun bonuses including this one for $264.00. 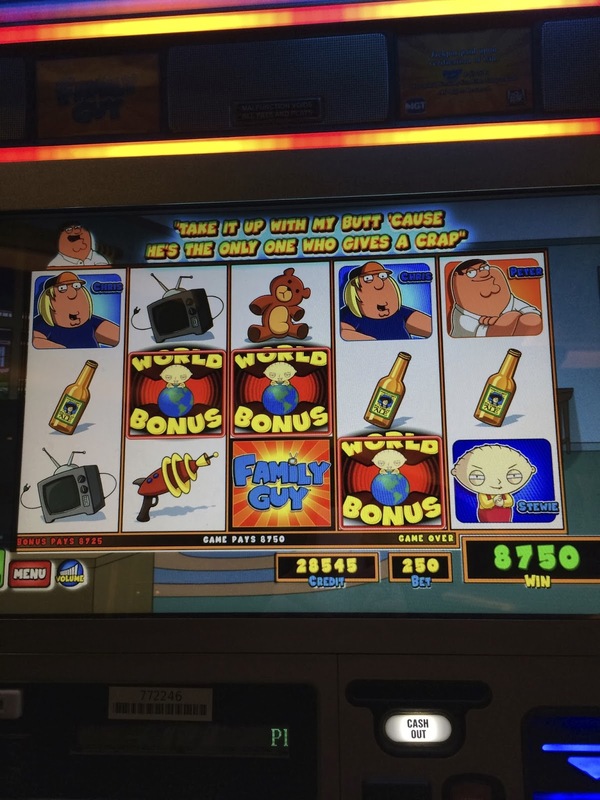 We played more slots for a bit but husband started losing, my son lost and went to bed defeated by the electronic craps table, while I continued to win. Shocker! When I went to bed on Christmas Eve I ended up not losing any money for the day, and still had my winnings from V&P with the exception of what husband and son had lost. The next morning we got dressed and went to Mom's suite to open our presents. Everyone was happy with their gifts and we headed out for our 10:30am Christmas breakfast at Four Season's Verandah Restaurant. Normally I would have preferred breakfast/brunch a bit later but this was the last seating before Verandah started their special prix fix for Christmas. Having breakfast at Verandah was perfect for Christmas. Service was great, seating was comfortable and while the restaurant was doing a good business we didn't have crowds or noise! My Mom's breakfast below wins the award for cutest, healthiest and tastiest! It was the gluten free Quattro. Mom doesn't do a gluten free diet, this just appealed to her and I was sorry I didn't order it when I saw it. This came with choice of juice, coffee or tea, mini gluten free waffle, fresh berries, Vermont maple syrup, scrambled egg whites with presto vegetables, tomato compote, citrus segments in agave nectar with a carrot juice shooter! The other breakfast I wished I had ordered was my son's Huevos Rancheros with black beans, chorizo sausage, jack and cheddar cheese and roasted salsa, it was so yummy! My husband's breakfast of a omelet with bacon and ham didn't inspire jealousy nor did it get a photograph! My poor breakfast was prepared perfectly but after seeing Mom's dish and Matt's, my egg white omelet was so boring! I love Verandah and will return there again soon but no more egg white omelets. 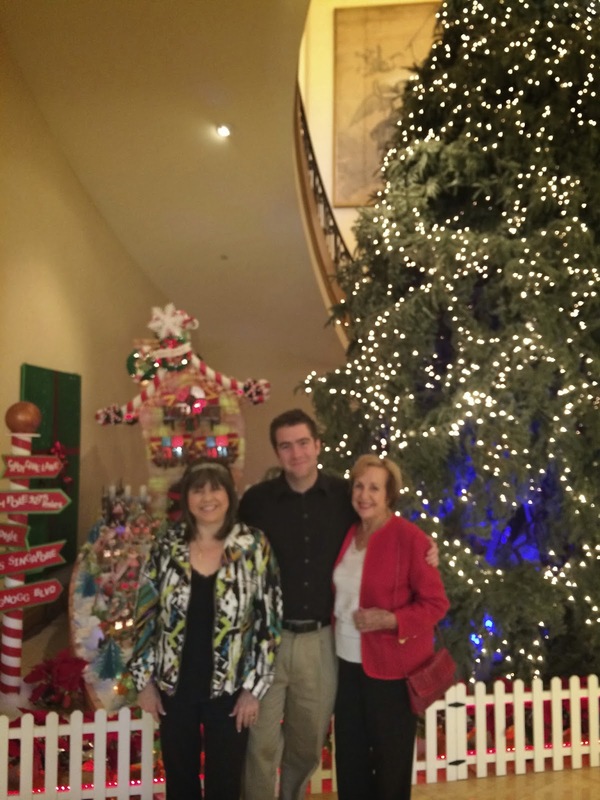 After breakfast we took a couple photos of the Four Season's Christmas tree and village near their main staircase. So what to do for our first Christmas in Vegas? Surprise we gambled! Mom headed out for Willy Wonka, she loves that slot even when she doesn't win on it. 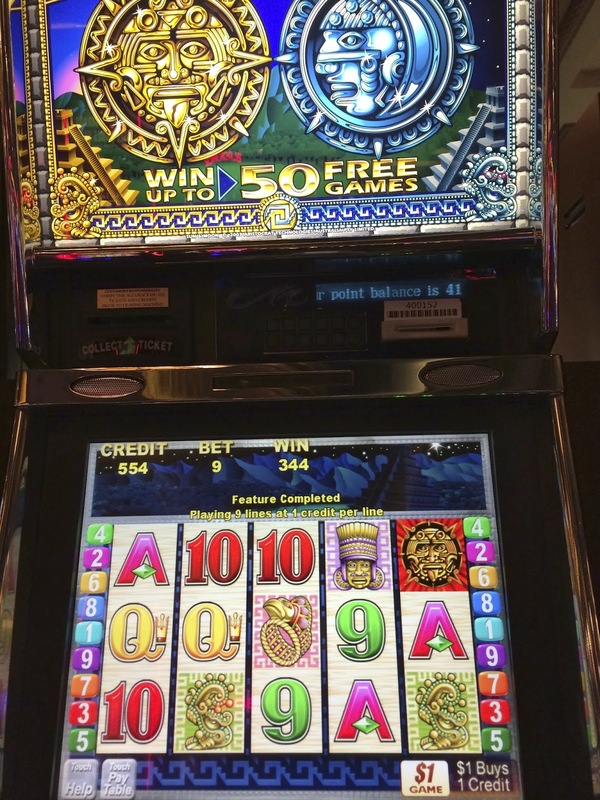 My husband went immediately to a old favorite of his at Mandalay Bay, WMS Shimmer slot. 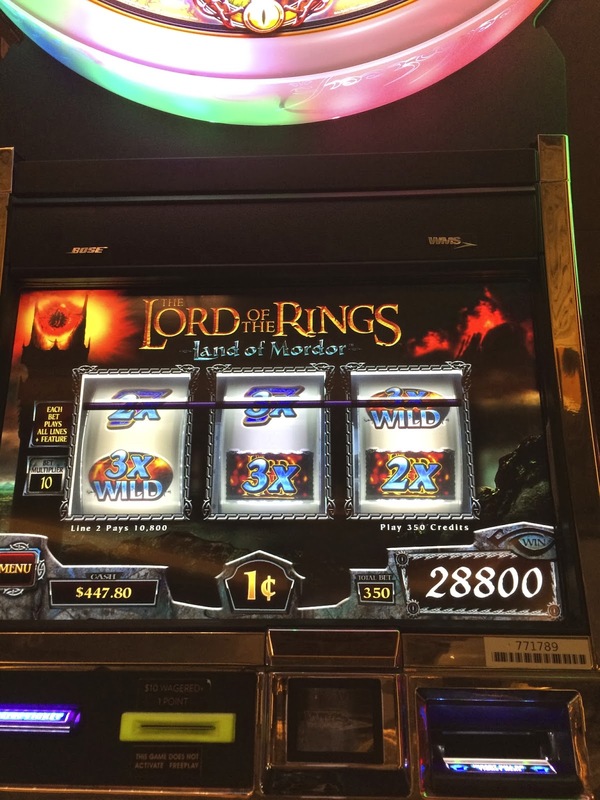 Normally I discourage him from playing it because it's hard to get a bonus on it, but this trip he had several and some paid out fairly well. 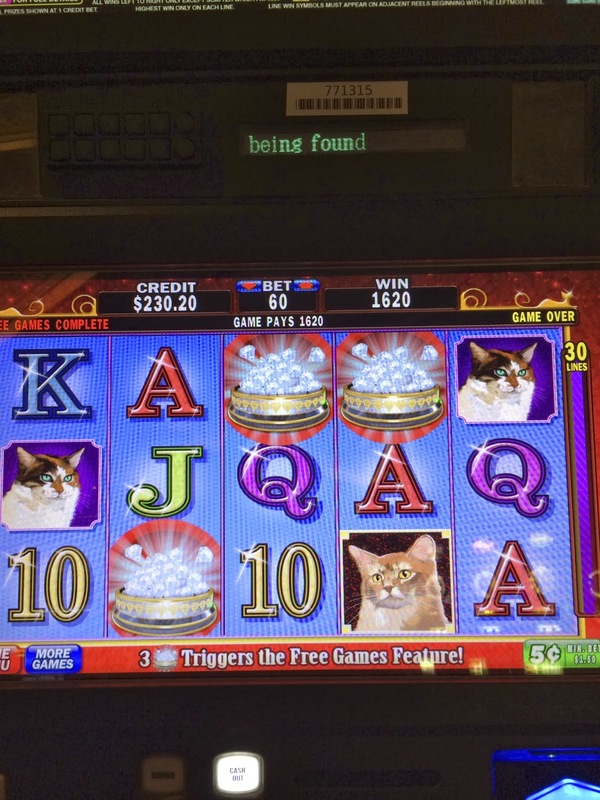 If you like this slot, here's a video of one of his bonuses. After a couple bonuses I left Randy playing Shimmer and found myself drawn back to Lord of the Rings where I had a few bonuses, the one below being the best. 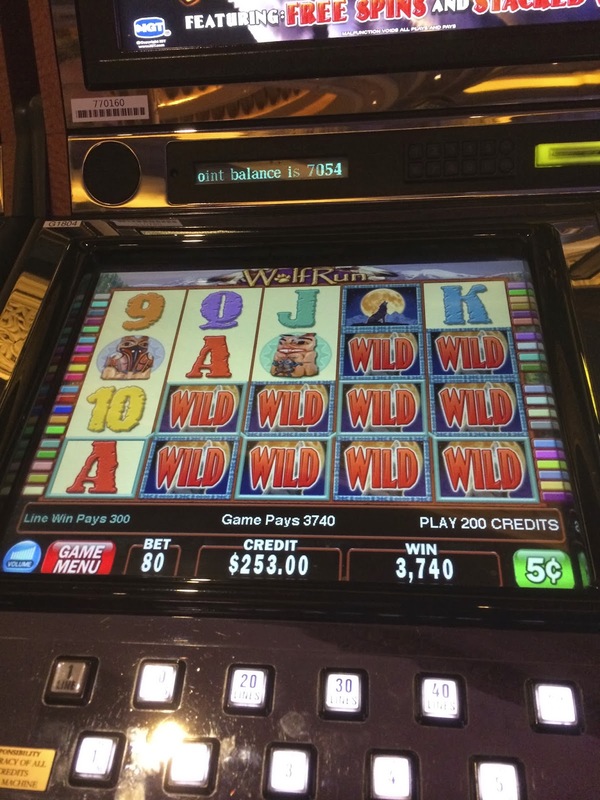 Then becoming bored, okay I started to lose, I decided to do hit and runs on a bunch of slots. Five cent Kitty Glitter gave me a bonus but not a great one. One of my favorite slots but this year it just hasn't wanted to bonus for me and when I'm lucky enough to get a bonus they are disappointing. I wanted to play Aladdin but it was busy so I went around the corner and hit a Lois bonus on Family Guy. I'm not a fan of the TV show, but the bonuses are funny. 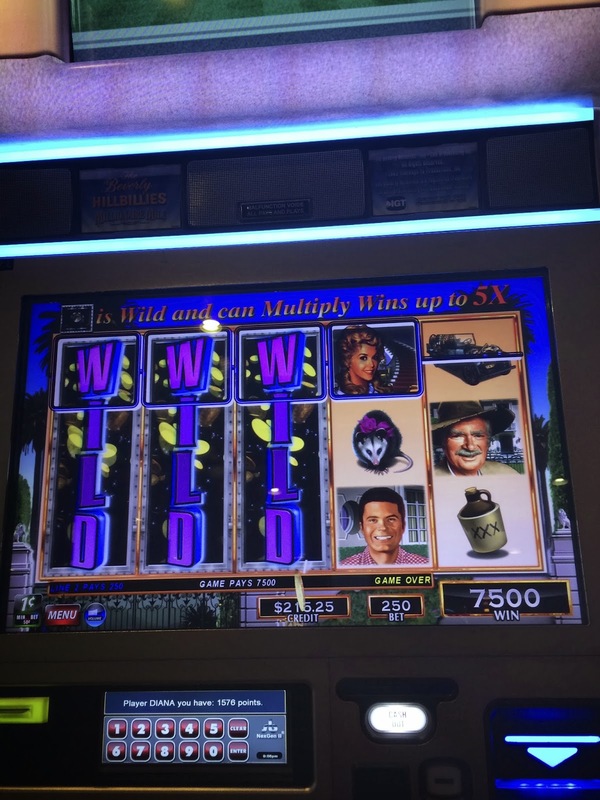 Since Aladdin was still busy I went to a old five cent WMS genie slot and hit $100 on a bonus. 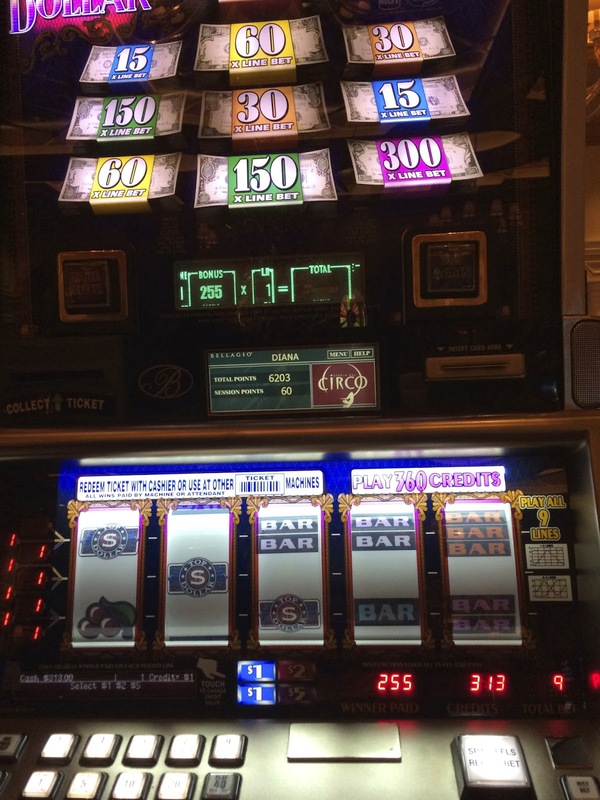 The penny and five cent slots I wanted to play were busy so I decided to try the dollar slots outside the Mandalay Bay HL room. It was a Merry Christmas indeed when I started hitting bonuses on $1 Texas Tea and Texas Tina. 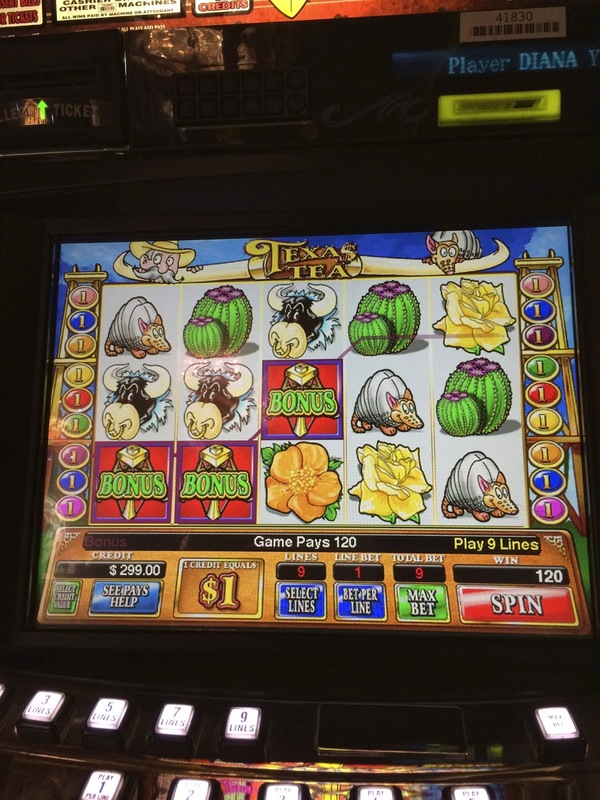 Here's a video of 2 of my Texas Tea bonuses betting $9 a push. Texas Tina was on the right side of Texas Tea and I had never played this slot before. I got hooked quickly and found myself going back to it frequently. Why did I keep returning to a slot that was $20 a push? Watch this video if you want to see a couple bonuses and some live play on $1 Texas Tina! 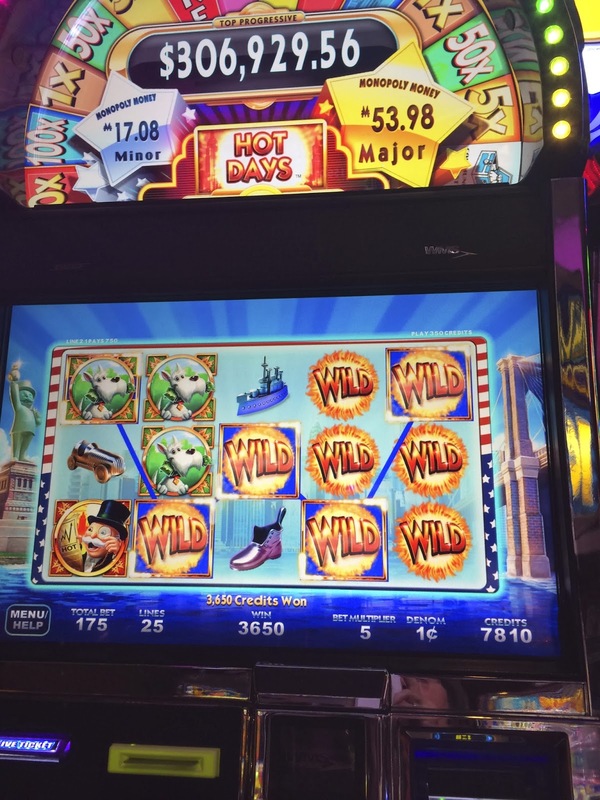 After Texas Tina I tried my favorite $1 DaVinci slot but it was taking more then giving so I went on to $1 Sun and Moon where I had a decent bonus of $344.00 on a $9 bet. It was time to dress for dinner at Gordon Ramsay's Steak Restaurant at Paris and it wasn't long before we were in a taxi and at Paris. We had 30 minutes before our dinner reservation so the four of low rolled at Paris and managed to lose a few hundred before dinner. The CET properties never have liked me, I've yet to walk away a winner. I had a reservation for five months for Christmas dinner for 6:00pm so we would have plenty of time to return to Mandalay Bay for the late show of Michael Jackson One. Despite the reservation we still ended up waiting 15 minutes or so for a table, mainly I suspect because they want you in their bar drinking. 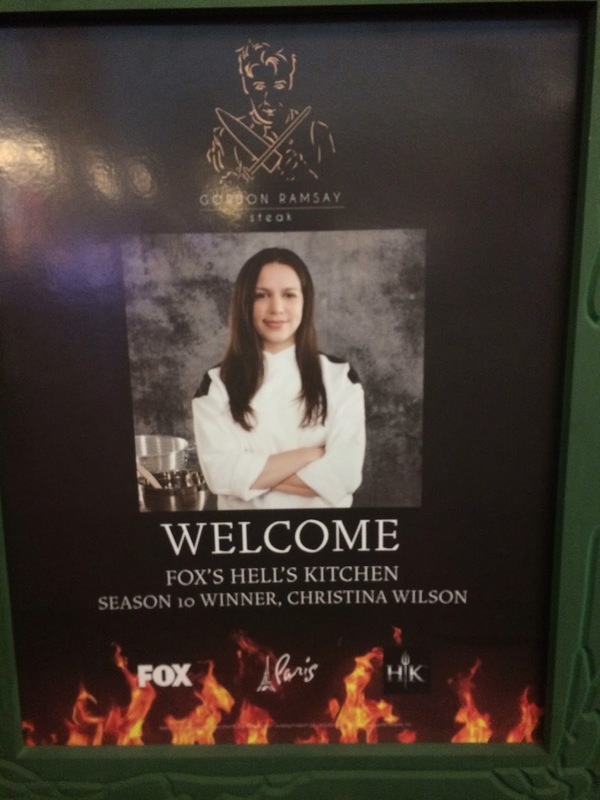 Hell's Kitchen winner Christina Wilson was working in the open kitchen on Christmas evening and there's a sign outside the restaurant welcoming her. After a bit of attitude from the hostess when I asked after we had waited 15 minutes for a table how much longer it might be we were finally seated with menus. Shortly after being seated they bring a trolley out with the different cuts of meats so they can explain what they have. While we didn't get the booth upstairs or a table off to the side as I requested months ago the table in the center of the restaurant ended up being fine and we had a good view of the kitchen cooking with Christina directing them. What wasn't fine and was a sour note during most of dinner was the super loud music they play. Seriously turn down the sound track! After we had place our ordered I went to the restroom to wash my hands. 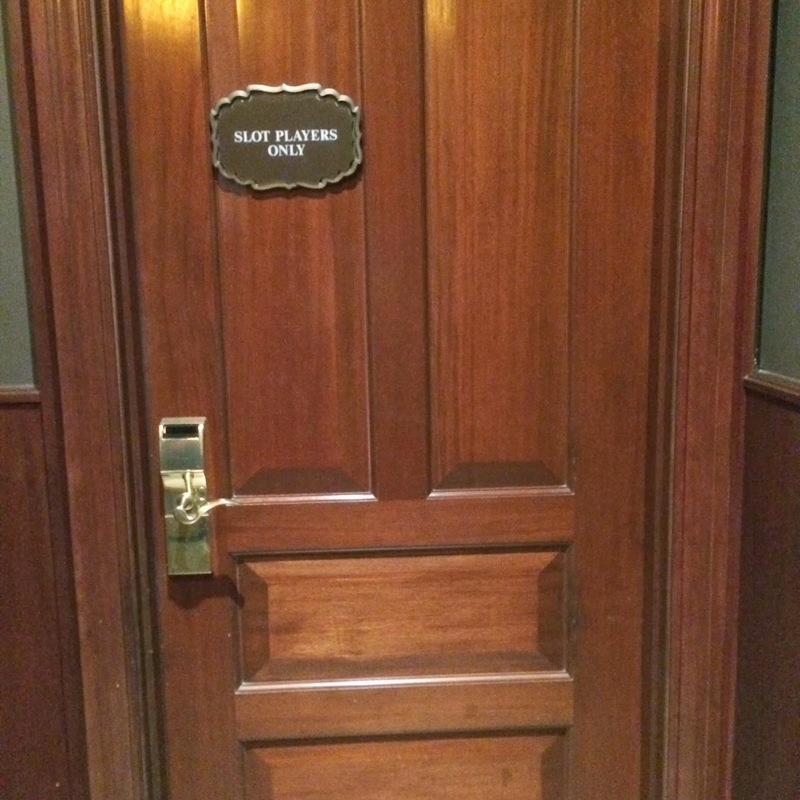 Right before I got to the ladies room there was another door that said slot players only, which cracked me up! 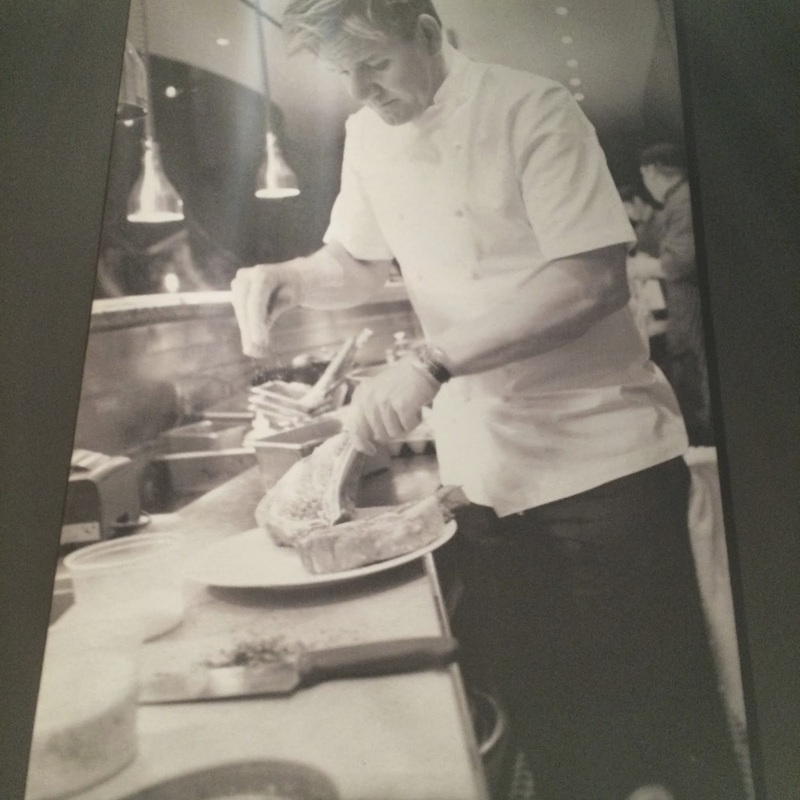 Also in the restroom hallway are lots of photos of Gordon Ramsay. 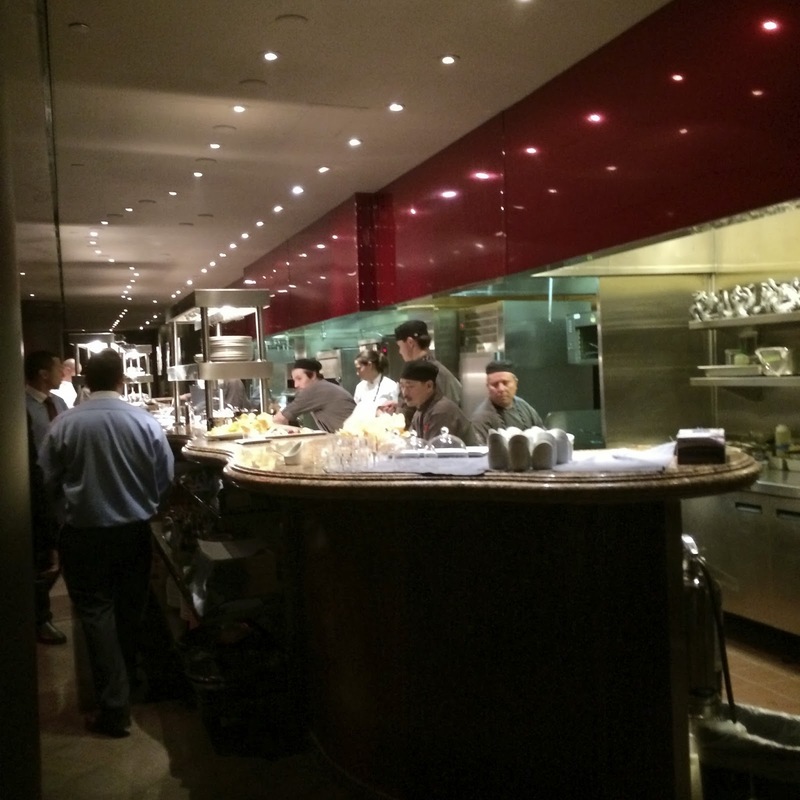 As I was walking back to our table I passed the kitchen and grabbed a shot of Christina and the other chefs. I'm not a big eater of bread, though I do have a fondness for pretzel bread. Ramsay's bread was outstanding in fact we asked for more of the pinwheel rolls that had fig and bacon, which isn't something we normally do. The salt on the butter is volcanic salt! 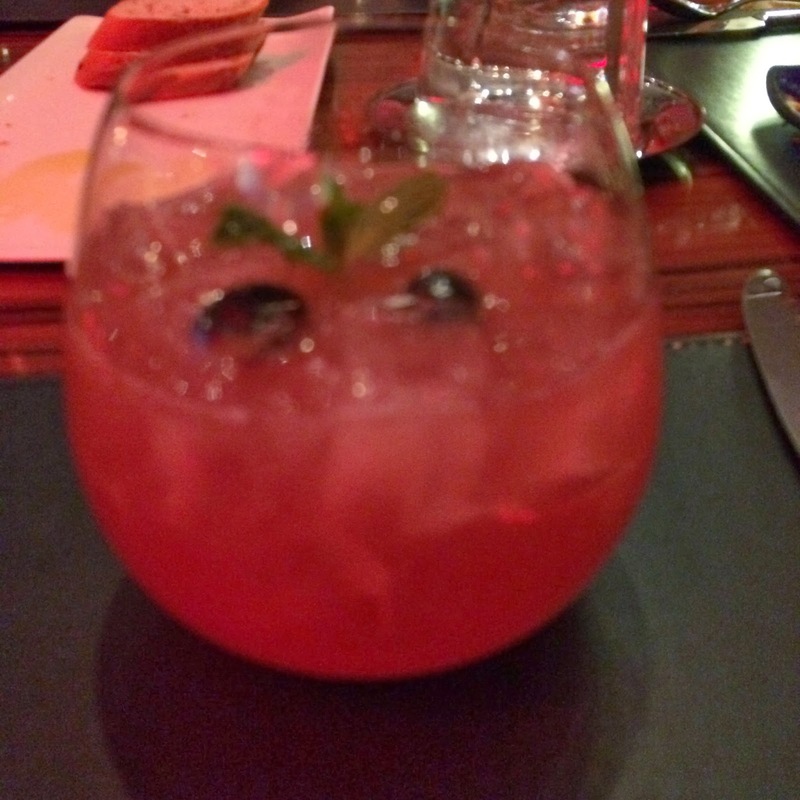 I ordered the HK Antioxidant with Acai Berry Liqueur and fresh blueberries that was recommended by our server. Not sure how healthy this drink is, but I had two, I liked it! My husband had the Patron Silver Margarita, Mom had Vodka on the rocks, her usual. 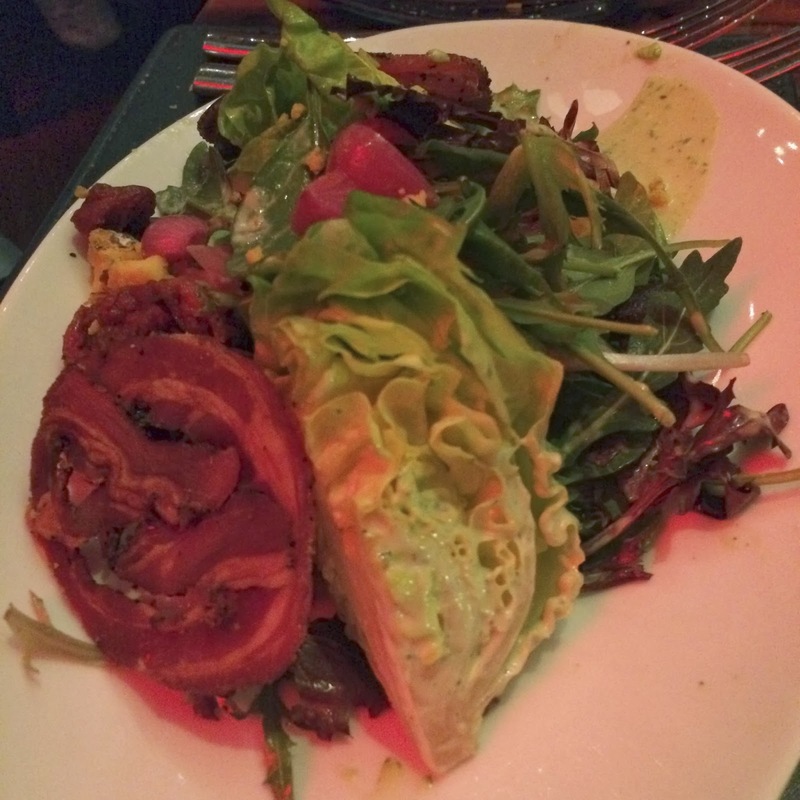 Mom's Market Green Salad had butter lettuce, pancetta, other greens, shropshire blue cheese, tomato raisins in a green goddess dressing that she said was excellent! 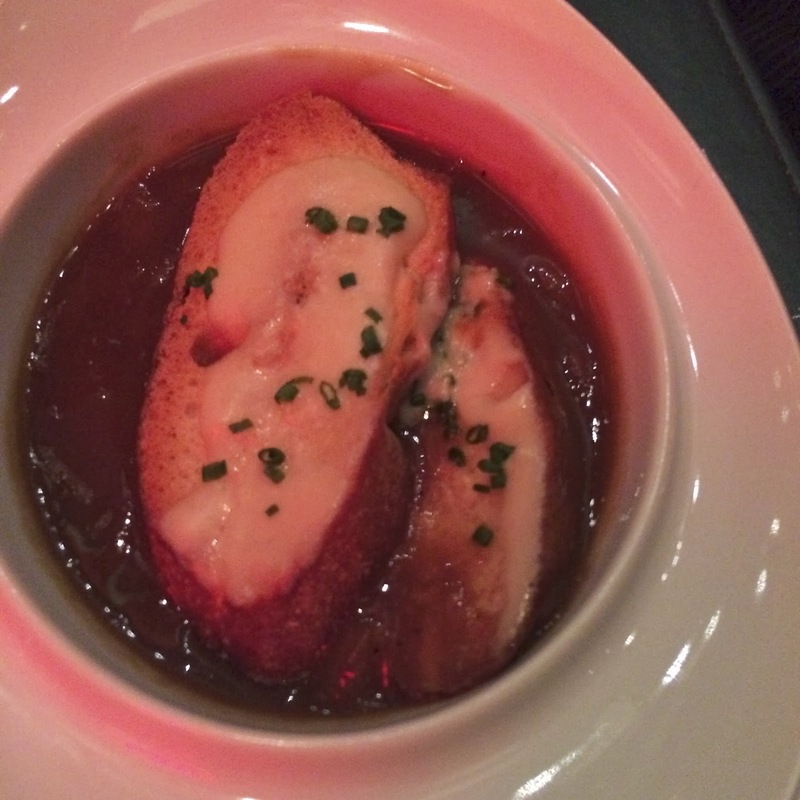 British Ale Onion Soup was ordered by my son and he loved it! Randy ordered a Caesar salad and it was fine. Roasted Beet Salad with horseradish, goat cheese and creme fraiche was my choice and it was good. Mom ordered the Fish and Chips. The fish was a Mediterranean sea bass and she said it was some of the best fried fish she's eaten. Our sides were really great. I loved the Haricot Verts which were tempura fried with a garlic citrus aioli. The Roasted Heirloom Carrots were outstanding with ranch powder and a slight tang from hot wing sauce. Our son ordered the Bone-in Ribeye and it fell off the bone, and from the taste I had the flavor was outstanding. After tasting my son's ribeye I wished I had ordered that instead of the filet. Randy and I both ordered the filet with peppercorn sauce and it was tender and delicious but as mentioned my son's ribeye was better. Mom and Randy order a large pot of French press coffee. 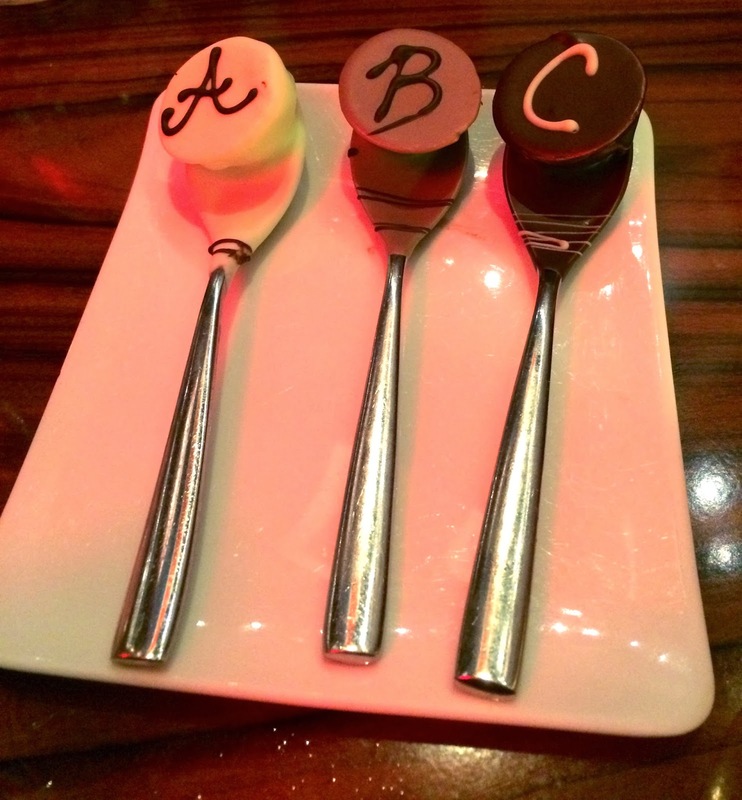 It came with three chocolate liquor flavored spoons, a nice tasty touch! I remember one spoon was Amaretto and another was Bailey's flavored but can't recall what the third flavor was. Sticky Toffee pudding! Our server made a point of telling us that customers tell him that their sticky toffee pudding is better then the one served at the Gordon Ramsay pub at Caesar's Palace after I told him my Mom and I had loved it there last August. When our order of two puddings arrived they were delicious, but not quite as good as I told my son as what we had at the pub. My son then told me the server was passing behind me at the time and overheard my remark. Well too bad, it wasn't as good due to the brown butter ice cream that was shaped to look like a quarter pound of butter. The ice cream was yummy but very hard to cut and didn't melt into the toffee and pudding like the ice cream served at the pub which was round in shape and softer. Regardless of my opinion of the molded ice cream, this is a dessert not to be missed, order it! Our bill, ouch! Not used to not having the food comped off. 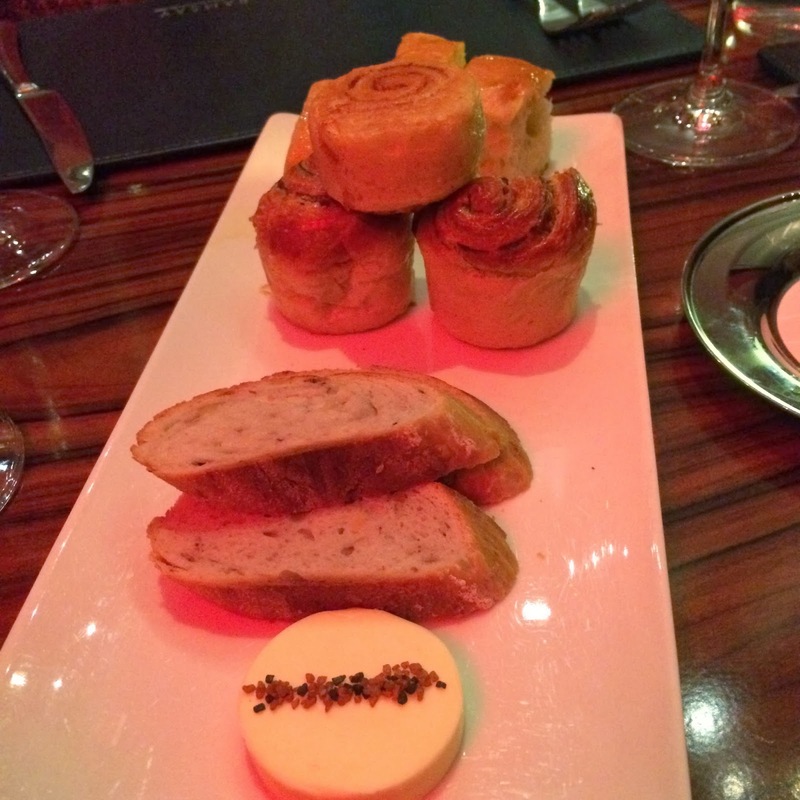 However, I did love our dinner at Gordon Ramsay's and I would return to eat there again if I hear they have turned down the music. So what is that in the photo below? 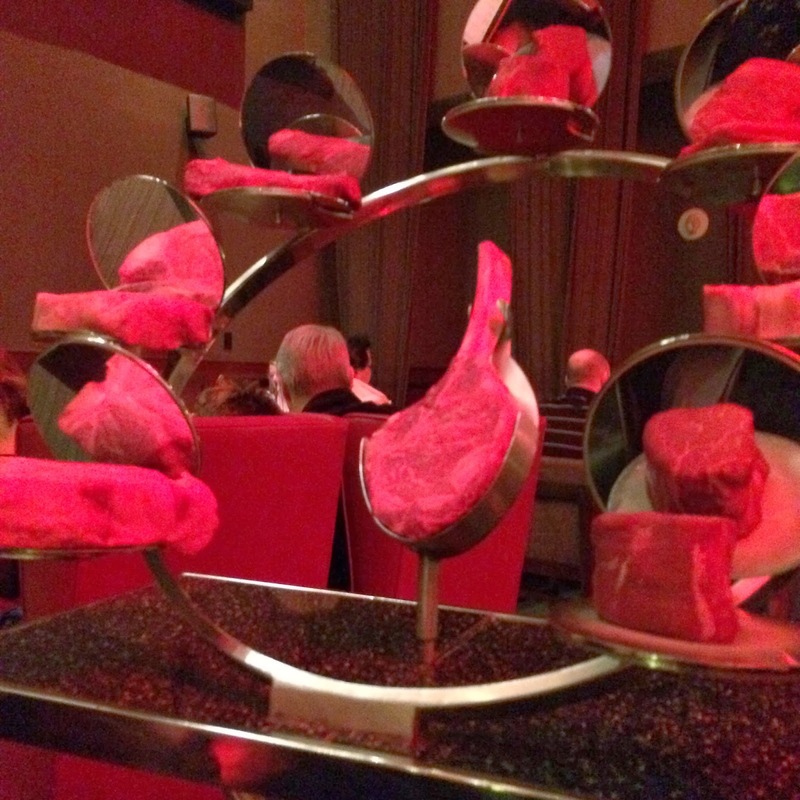 It's a chandelier that represents the hand movement of Gordon Ramsay when he prepares Beef Wellington! 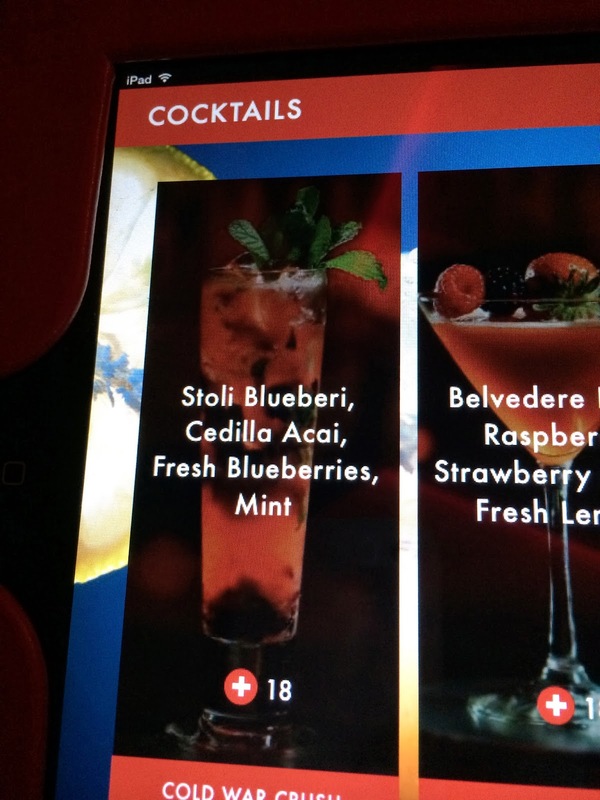 It's also printed on the menus and who knows what else they stuck it on? 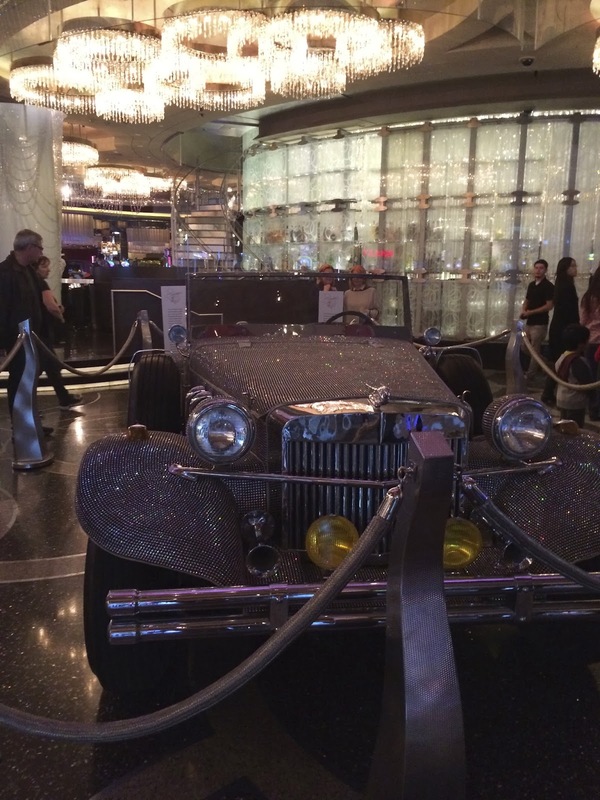 After dinner we took a taxi to Mandalay Bay just in time for the Michael Jackson One show by Cirque du Soleil. These photos of the entrance doors and across the hall was of course not taken before the show started, I waited until late at night around 2am. I never went into the Michael Jackson store, but some of the displays in the windows are interesting. The photo below was taken about 30 minutes before the show started. Merry Christmas Mom! 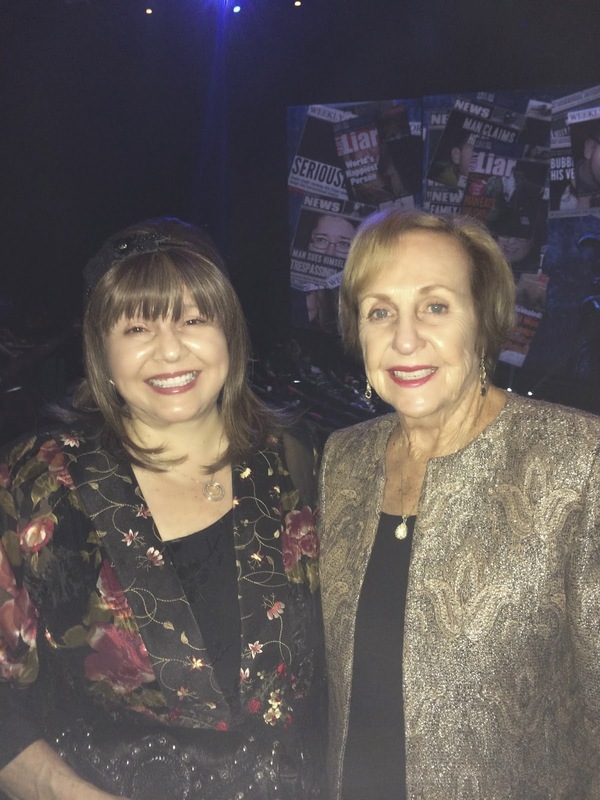 Mom loved the Michael Jackson One show! Despite the empty seats during the pre-show below, the show was a sell out and all seats were full when it started. Above is part of the pre-show. We had great seats, the first row center upstairs. We could see the whole show from these seats unlike the seating near the stage where you might miss action above and behind those seats. The cast also comes into the audience several times during the show and a few times they were right in front of us and slapping hands with us. 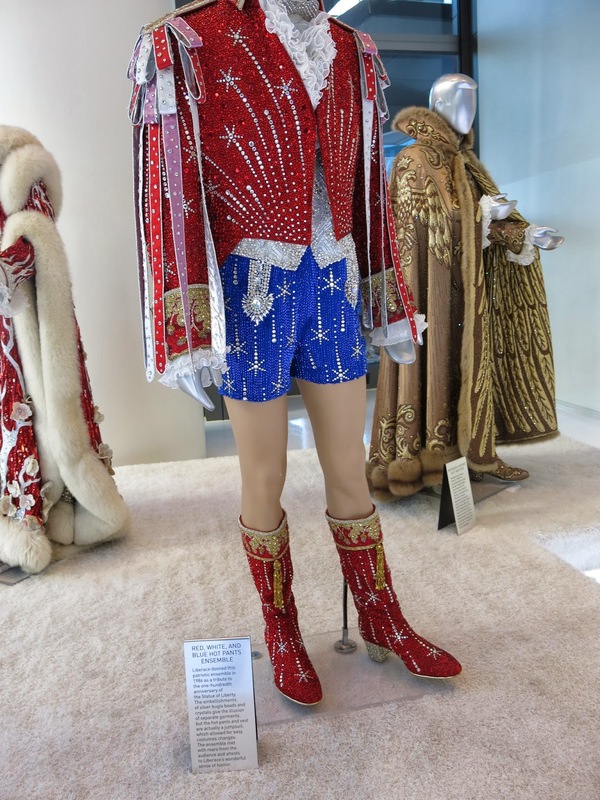 The last few years I have seen Elvis and Zarkana and while they were okay I was disappointed in the shows. A year ago on Thanksgiving when we saw Zarkana Mom and her friend Alan actually fell asleep during part of it! Not this year, all of us loved it with the exception of my son who just liked it. It was late after the Michael Jackson One show so Mom went back to her suite, while Randy, Matt and I played a few slots before we went to bed. 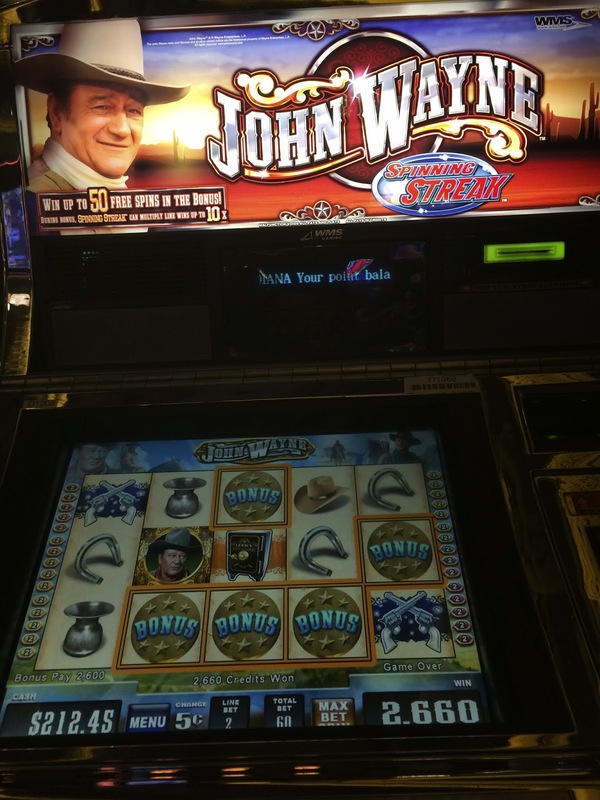 Been a while since I played John Wayne Spinning Streak but it gave us a nice bonus. 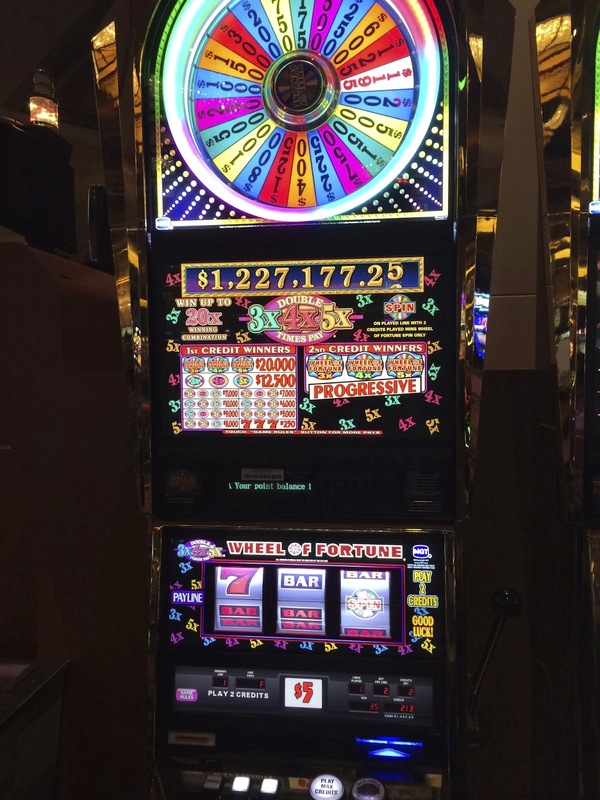 Here's a video of it if you like this slot! Next morning we had brunch at THEHotel Cafe. Once again they have changed their lobster salad recipe on me. I guess nothing will ever be as good as the original I loved but this one was better then the previous one that was served in the shell. My son ordered a breakfast Burrito which he said was tasty. Mom a year ago had really delicious French Toast at THECafe so she ordered it again but this time it wasn't as good. Randy had a omelet with hash browns, hard to go wrong with that. After brunch we took the Mandalay Bay Tram to the Excalibur station and from there walked over to Monte Carlo on our way to Bellagio to show Mom the Conservatory. 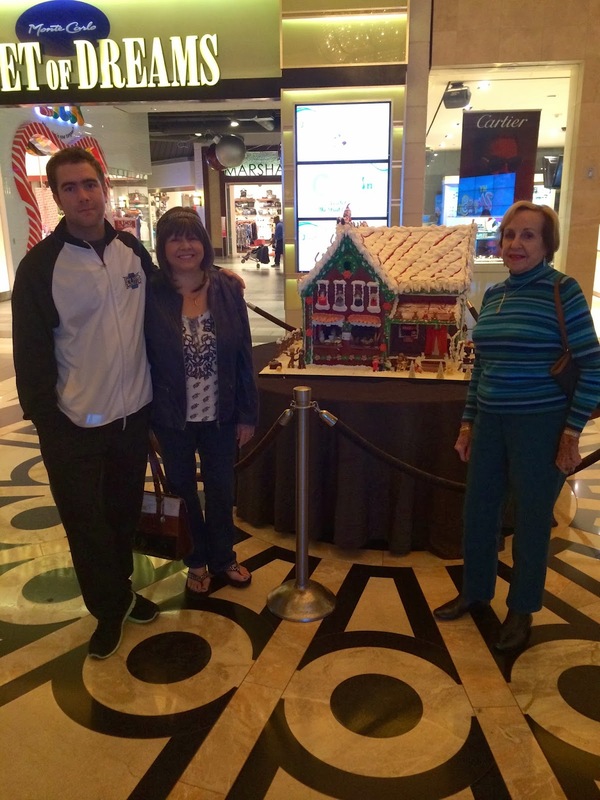 Monte Carlo had a cute GingerBread house on the way to the Tram. 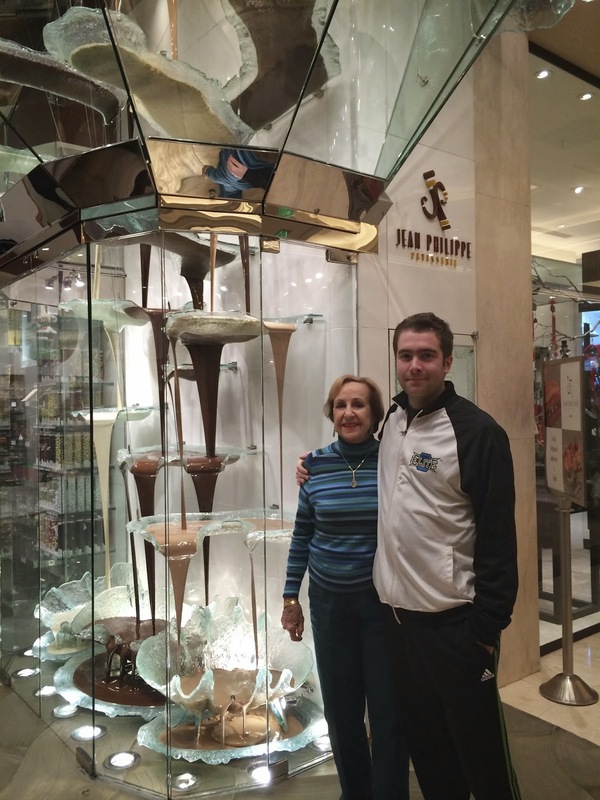 Mom and Matt by the famous chocolate fountain at Jean Phillips at Bellagio! All of us enjoyed the Bellagio Conservatory though it was very crowded. My photos are at this link and they are from both this trip and the following one on NYE's where I was able to get some photos in the am hours when the Conservatory is deserted. After the Conservatory, Randy and I had to play a bit of Clue as Bellagio seems to be the last casino on the strip that has it. I couldn't get a bonus on it but Randy got lucky. Here's a video of his great dining room bonus on Clue. I was shocked at my husband's fabulous picking skills! 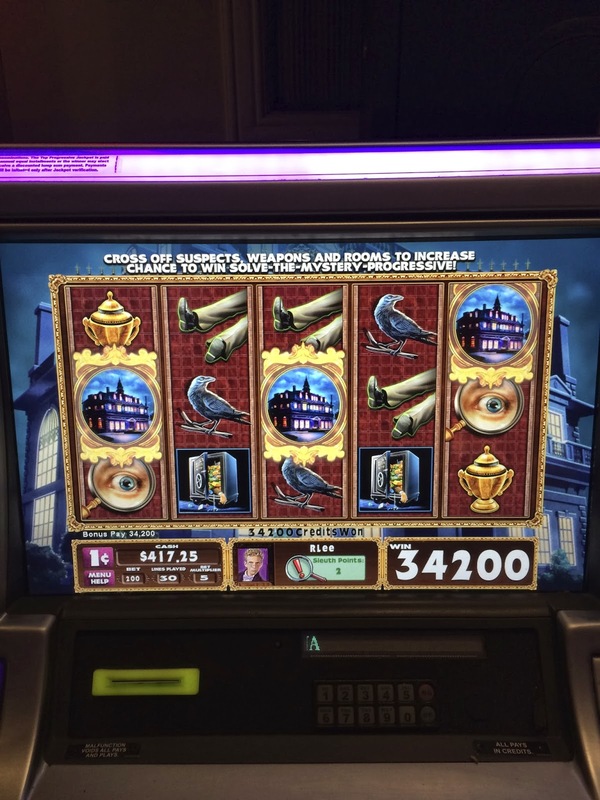 Since I wasn't winning at Clue I went to the Bellagio High Limit room to visit a favorite $1 Top Dollar slot there and got lucky with a bonus for $255.00. We decided to leave Bellagio while were ahead and the four of us walked over to Cosmopolitan to see the Liberace exhibit. 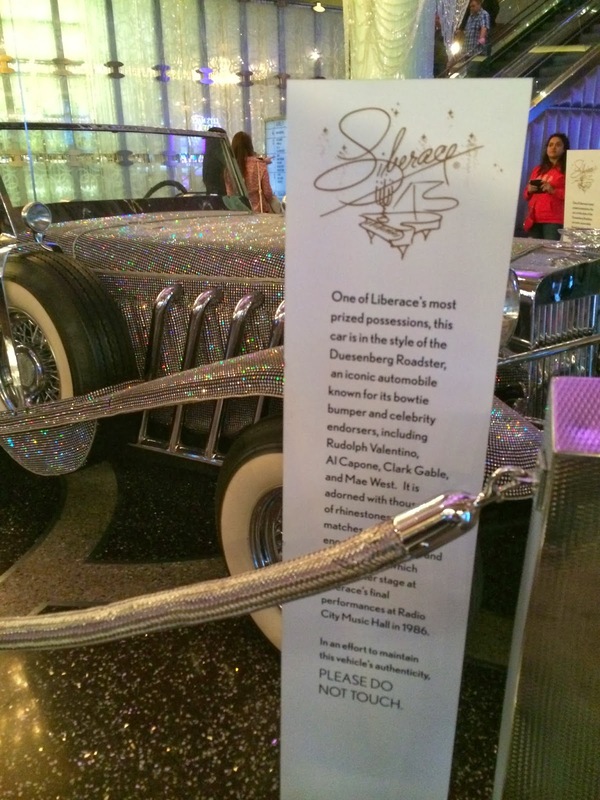 Outside of the store that displays Liberace's limited exhibit is one of his custom cars on display. Talk about glitz! 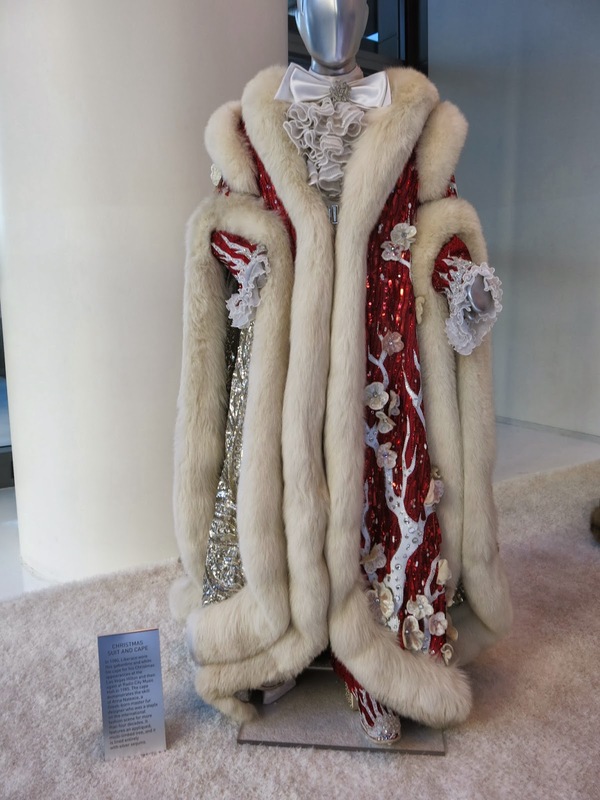 Liberace certainly knew how to stand out from the crowd. 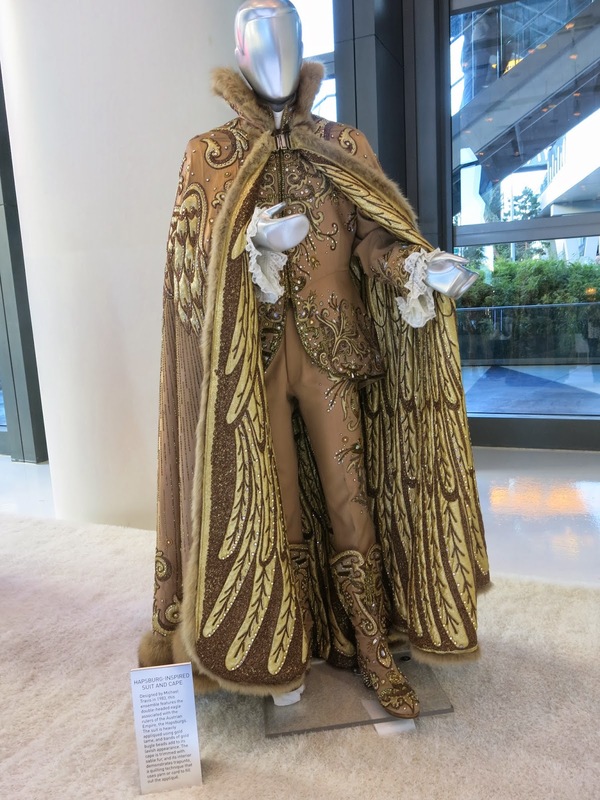 We enjoyed seeing the custom made costumes, Piano and one of Liberace's Roadster's. The show was free but there was a donation box by the door so we donated. Unfortunately the exhibit is no longer there as I write this trip report it closed on January 2nd. It's suppose to open up downtown at the Neonopolis in the future and at that time exhibit the complete collection. As we left the Liberace exhibit we briefly play for a bit at Cosmopolitan, but the only one to have any luck was Mom when she used her $100 Cosmo Identity promotion to play Wolf Run 2. Since I've never had any luck on Wolf Run 2 I almost told her not to bother playing it but who knew Mom had such mad picking skills? Who knew Wolf Run could have a good hit like this? Not I! 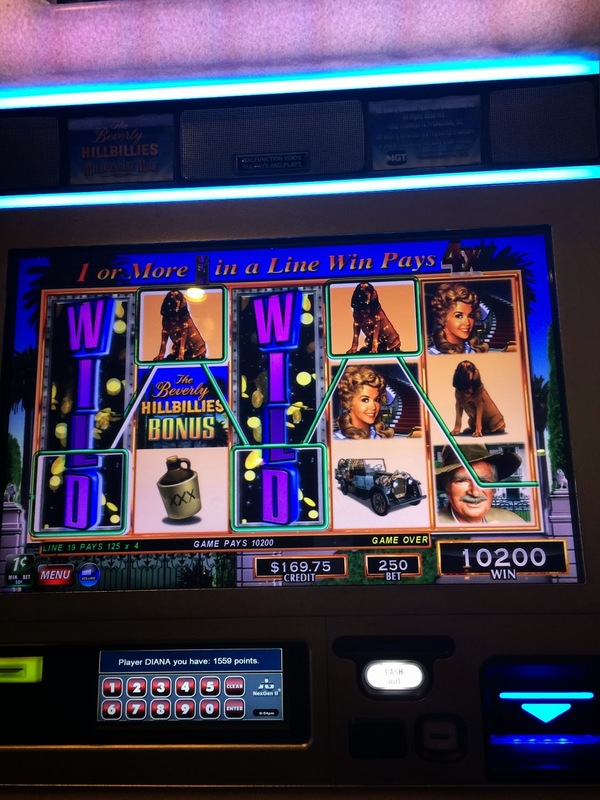 After Mom's great bonus she played the rest of her identity play, hit a couple more nice hits on Wolf Run 2 and then took the movie and ran all the way to Aria! Actually we all went to Aria but we walked there via the outside sidewalks and while I was all for taking the elevator at the walkway between Cosmo and Aria Mom made me climb the stairs, LOL! Now we know why I'm plump and Mom is slender at 80. After Cosmopolitan we walked over to Aria and admired their Christmas Tree and put money on Buddha for good luck before returning to Mandalay Bay. 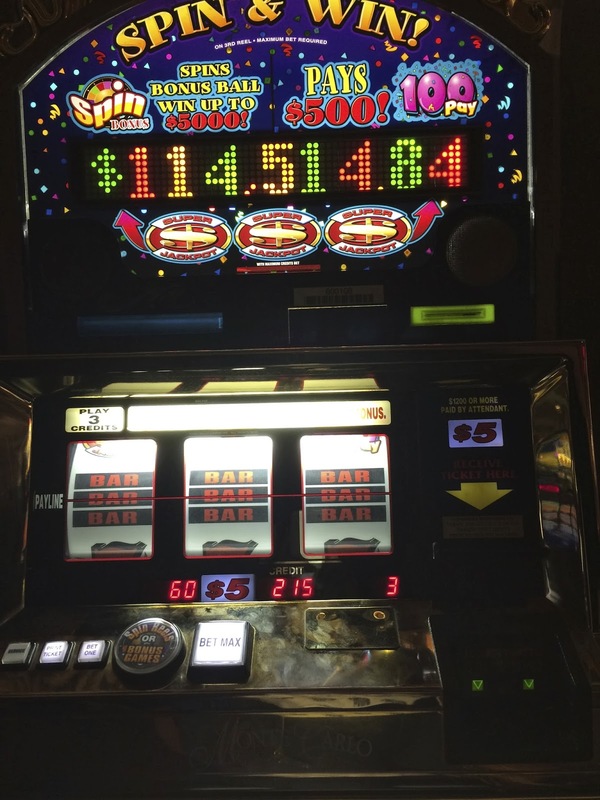 Back at Mandalay Bay we had some time before our dinner at Red Square so I hit the $1 slots again. 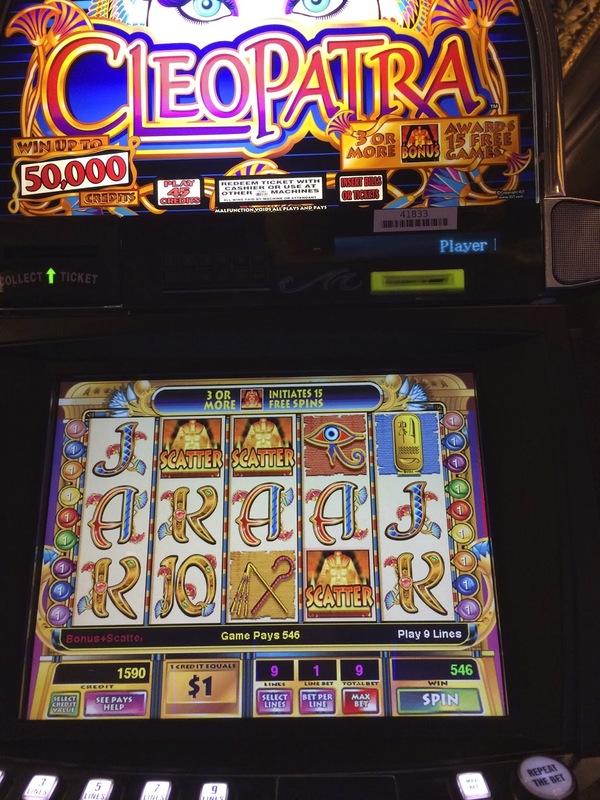 I was shocked but in a good way when Cleopatra dropped the $1000 hit on me above and then gave me the bonus below. 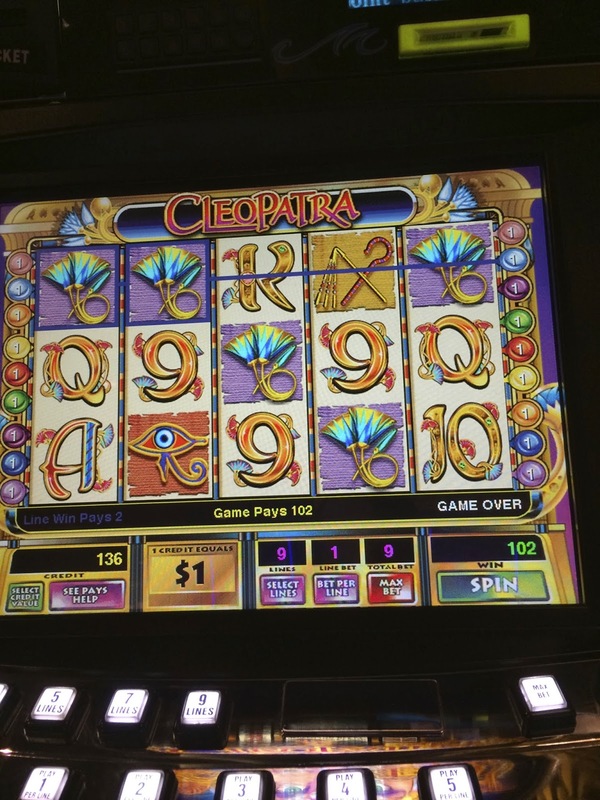 For those of you who enjoy slot videos here's a video of the Cleopatra Bonus and one that I got earlier on the trip. This is the last bonus I'll share in the trip report. 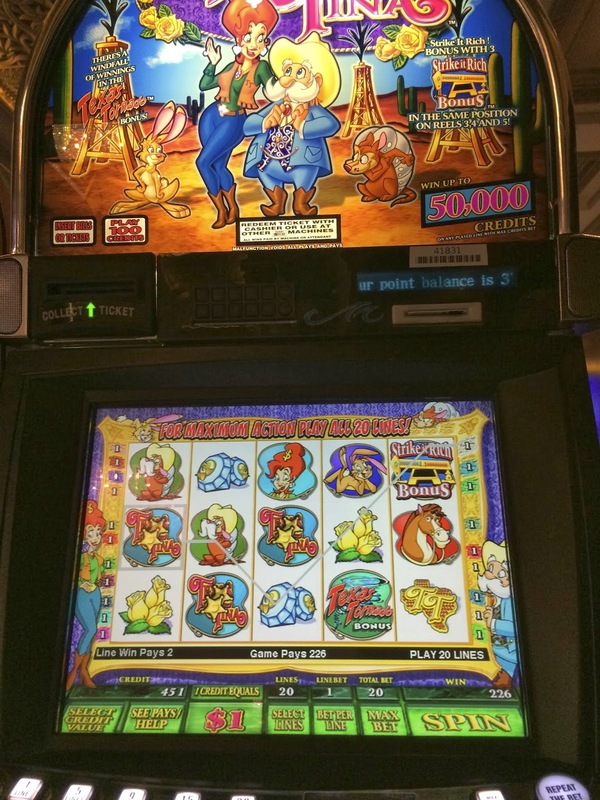 If you enjoy watching slot videos there are plenty on youtube of both old and new slots and you can find my channel by doing a search on dianaevoni. 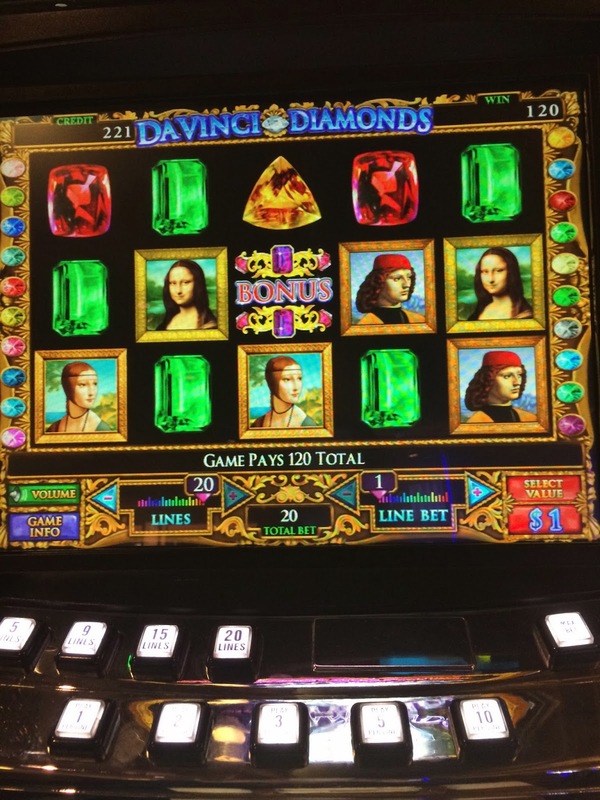 After Cleopatra I finally got my only bonus on $1 DaVinci for the trip but it was very bad for a $20 bet. Of course I couldn't ignore Texas Tina and had to give her a bit of play before dinner. While I'm playing Mom, Randy and Matt were all losing but my wins were still keeping me a winner for the trip for the first time this year! 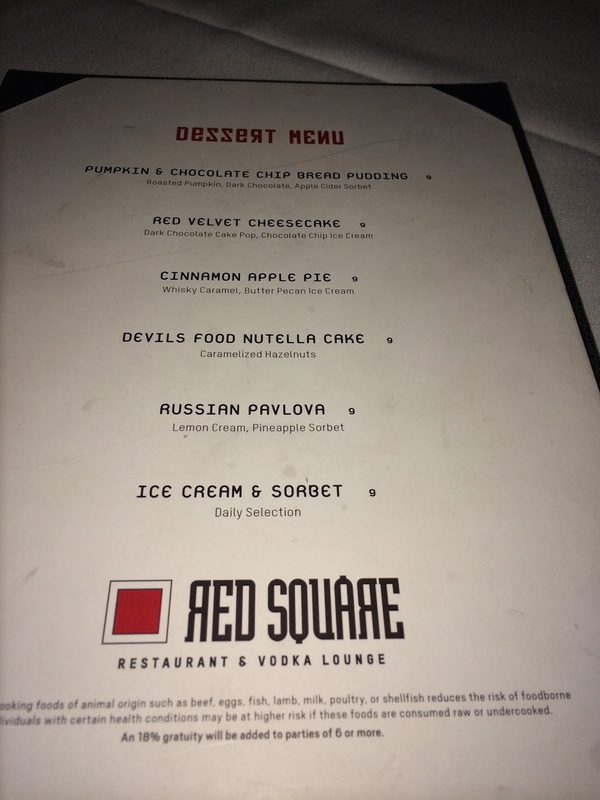 We had a early dinner at Red Square because Mom, Matt and I had tickets to Carrot Top tonight. 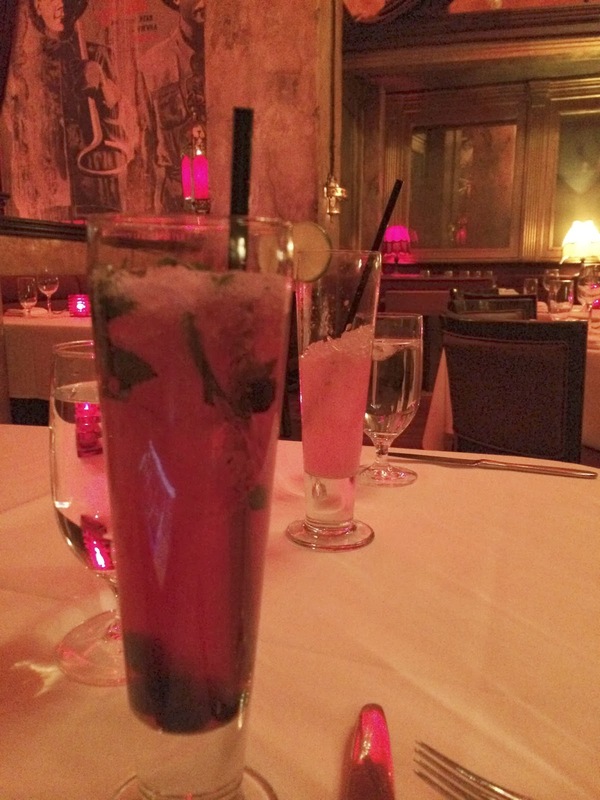 I had two drinks tonight at Red Square, one was the KGB skinny girl cocktail with Cucumber Vodka, fresh cucumber, watermelon and chili, fresh and yummy. The other drink was Cold War Crush (see below description) which was good but a bit more sweet then I like. All of us ordered off the Michael Jackson prix fixe menu with the exception of Randy. 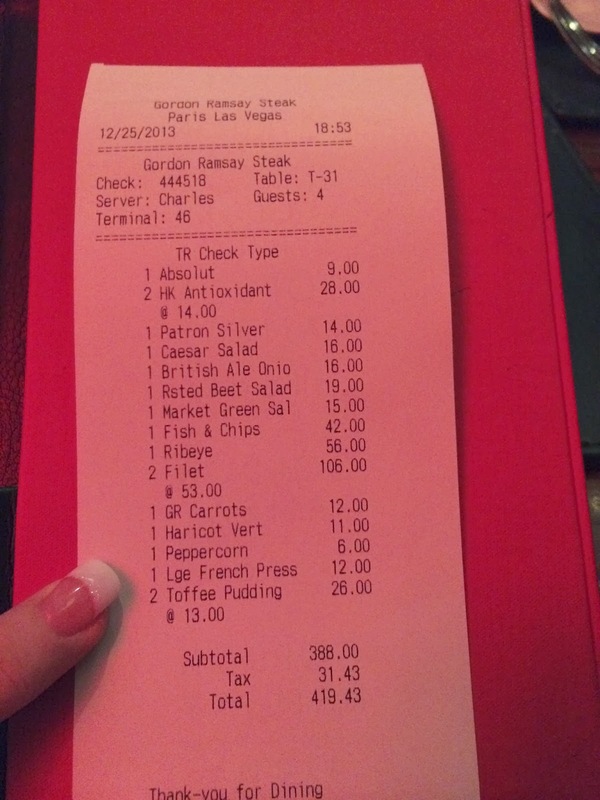 The prix fixe was $49.00 a person for three courses. Mom and Matt each had the salmon pizza with caviar and boy did they love it. My starter, mini lobster tacos were delish, I would order them again. Mom and I both had the Salmon with eggplant, and farro risotto, it was flavorful and I enjoyed the farro risotto a lot. Matt absolutely loved his beef stroganoff! Randy ordered the pawns off the regular menu and they had a salad on top, garlic scampi sauce and lemon risotto, he said it was flavorful and he would order this again. We were eating so early that most of the restaurant was empty! 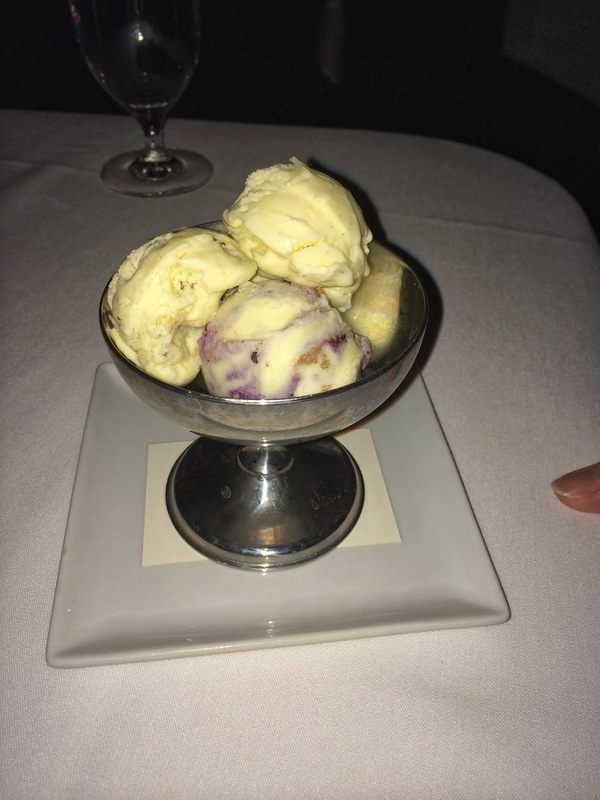 Yes, there was room for dessert, especially since ice cream and sorbet came with the prix fixe! Randy ordered the pumpkin and chocolate bread pudding with apple cider sorbet off the dessert menu since he didn't have the prix fixe. The pudding was good but couldn't compare to Gordon Ramsay's sticky toffee pudding! The cider sorbet was very refreshing. The prix fix came with assorted ice creams so that's what the rest of us ate. After dinner Mom, Matt and I headed off to Luxor for the Carrot Top Show. Randy went off to gamble. 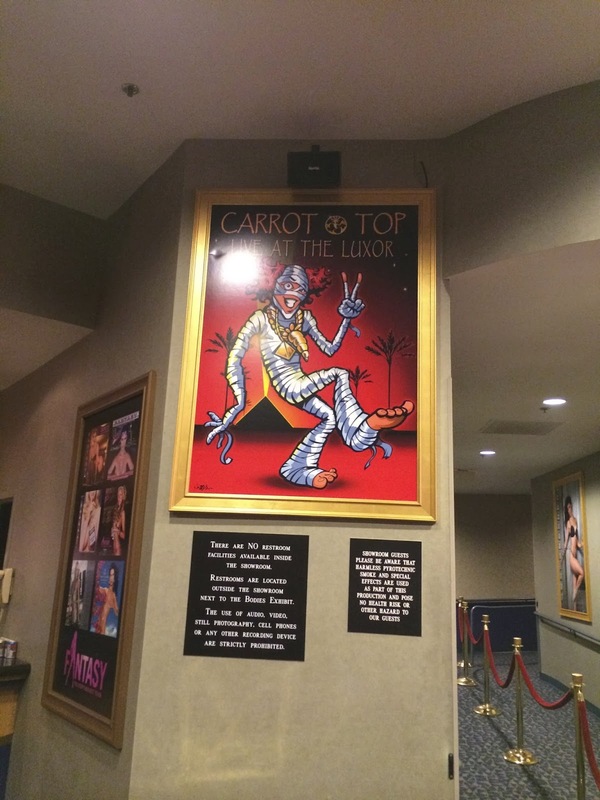 While I've never cared for Carrot Top on TV, Randy and I both enjoyed his Vegas show a couple years ago and I thought Mom and Matt would like it. We had great seats in the second row and settled in to enjoy the show. All of us enjoyed the comedian who started the show but while Carrot Top was okay, none of us thought the show was great. Carrot Top seems to have lost weight since I last saw his show and didn't have as much energy as I remember. Sure there were entertaining spots and it's cute how he singles out people in the first row and gives some of them shots of whiskey but the last 30 minutes really dragged for us. Perhaps it was just a off night because a friend of mine who saw him weeks later loved the show. This was our last night in Las Vegas together so after a night cap together we played more slots! I was still winning, Mom was more or less even, Matt was constantly losing and when Randy played with me he won, when he went off by himself, he mainly lost. 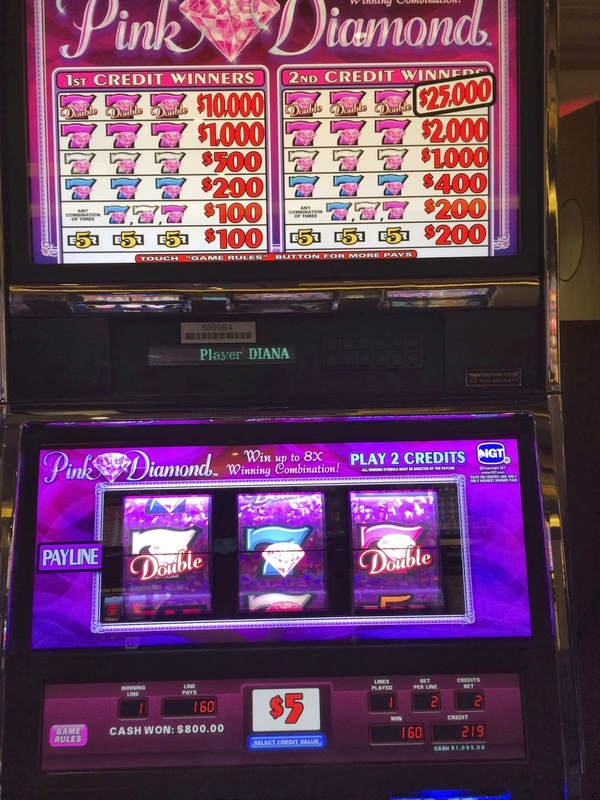 It was my 5th night in Vegas and I'm still winning, so I felt I had a streak going so that called for playing $5 Pink Diamonds in the MB high limit lounge. This is one of the few reel type slots I like and while it hasn't been very nice to me the previous couple trips tonight after three spins it hit for $800! Randy was with me when we hit on Pink Diamonds and we decided to take the money and run to $1 Sun and Moon where we had a nice little bonus. 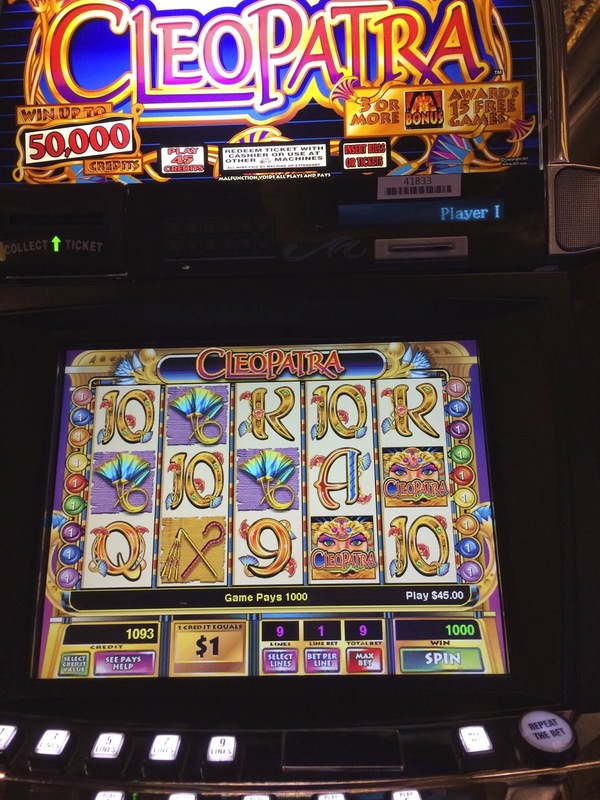 We then did a couple hit and runs on $5 Spin and Win and $5 Top Dollar! 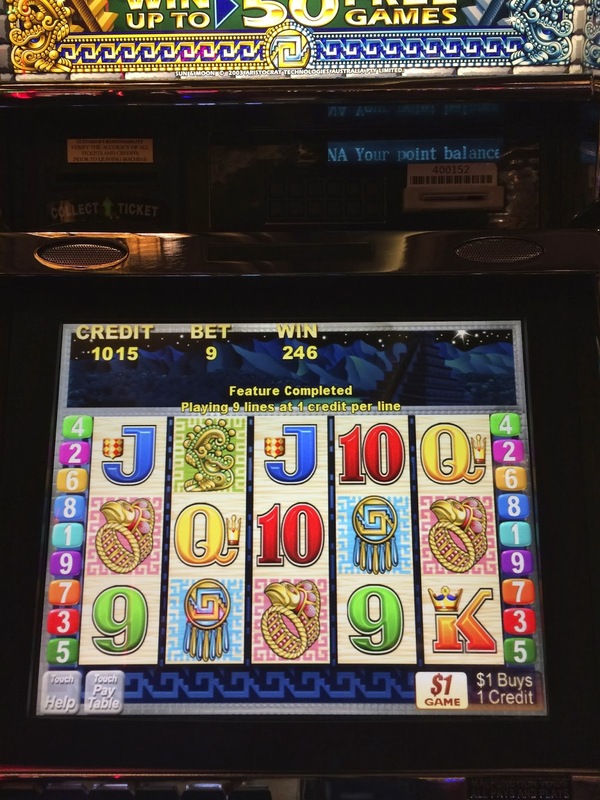 After the Carrot Top show I had put a $100 in the slots and now had a ticket of $1435.00 to cash out. 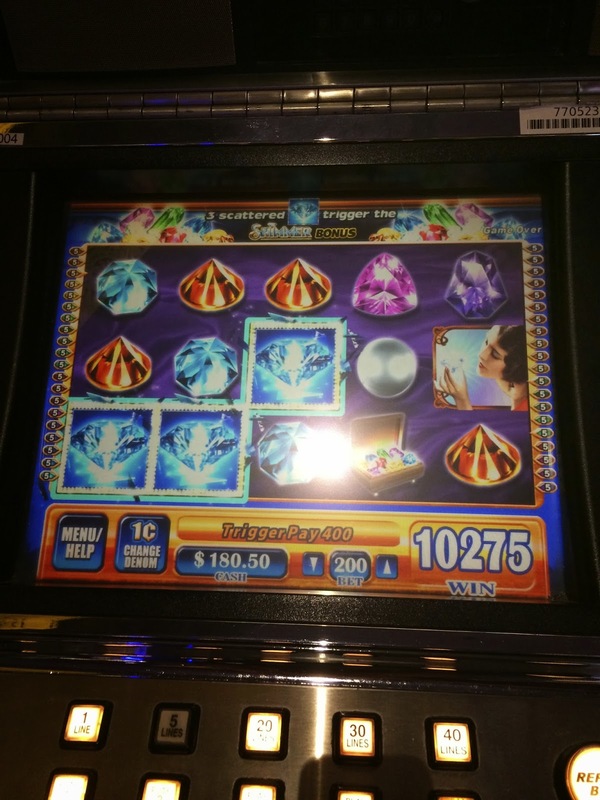 Actually it would have been around $1800.00 but I played a few penny slots and lost before I got a clue my streak might be ending. It was time to gather up Mom and Matt and go back to our suites for some sleep but we walked by $5 Wheel of Fortune and I had to try for a spin. Got one and then it was really goodnight and time to sleep! The next morning I woke up feeling like a winner in Vegas! It was a long time coming as most of 2013 was just losing trips or a couple where I broke even. I had lots of fun with my friends on those trips, great meals, shows, wonderful memories but it's always a special visit to Las Vegas when one can return home with more money then you left with! Our last meal in Vegas for this trip would be at Crossroads at House of Blues. I used to love the House of Blues restaurant years ago but had stopped going for the last couple years as quality and service just wasn't there any longer. However, I heard they were better now and under new management, plus I had this restaurant.com coupon for $50 off a $100 or more bill so it was time to take a chance and return! When we got to Crossroads which is inside the Mandalay Bay casino I was so glad we had a reservation, the place was packed for lunch with a waiting line. Fortunately our reservation got us a table immediately. Our server recommended the Voodoo Shrimp as a started and we ended up getting two since my son didn't want to share. Good call by son as these shrimp were one of the best shrimp dishes I've ever had, just the perfect amount of spicy and sitting on the most delicious cornbread ever and I normally dislike cornbread! 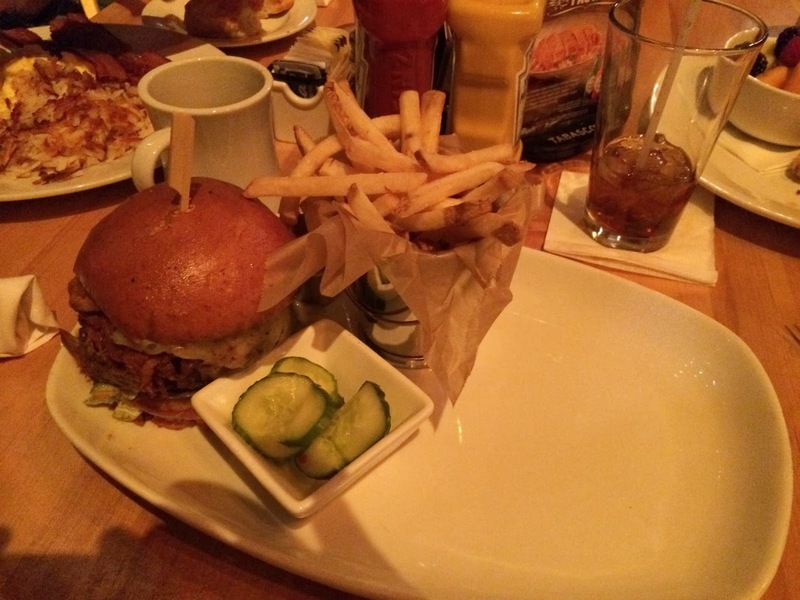 We could have had a order each and there wouldn't have been a shrimp or piece of cornbread left! Randy order boring eggs, okay so I don't care much for eggs, how could you guess? He did say these were better then the eggs he had at THECafe, so I'm thinking we have found our new favorite restaurant at Mandalay for breakfast and lunch! Matt had the heat seeker burger and the sauce it came with was to die for. Unfortunately while House of Blues sells other hot sauces they don't sell this one. Honestly they should bottle it and sell it in their store, it's got a incredible flavor! Mom liked her western omelet and fruit, though she couldn't finish it after sneaking away a lot of Matt's fries, LOL! My cobb salad was good and I really liked their balsamic dressing. After our great lunch it was time to pack up, check out. We got to the airport safely but Mom's plane to Fort Lauderdale was delayed for almost a hour. Our flight was more or less on time but since it was around the same time as Mom's delayed flight I got to see her safely onboard. 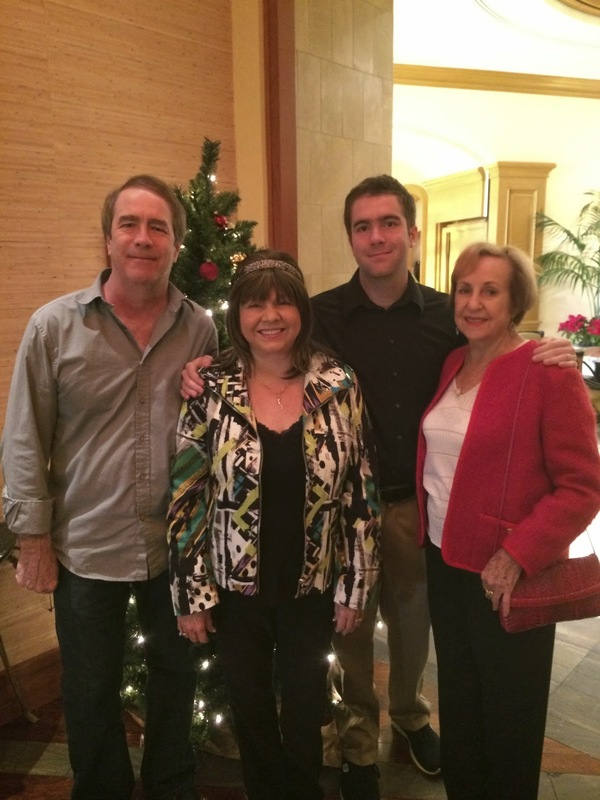 What a great Christmas trip, not only did I have a lot of fun with my family, but it was the only winning trip of 2013! While Randy and Matt lost about $1000 or so of my winnings from this trip I did get to return home with about $3000.00 more then I arrived in Las Vegas with and since almost everything was comped with the exception of the dinner at Gordon Ramsay's, it really was a Merry Holiday for all! As it turned out I was going to need these winnings because for the first time I was not only returning to Las Vegas within three days of a trip, it was going to be my first New Year's Eve in Vegas! 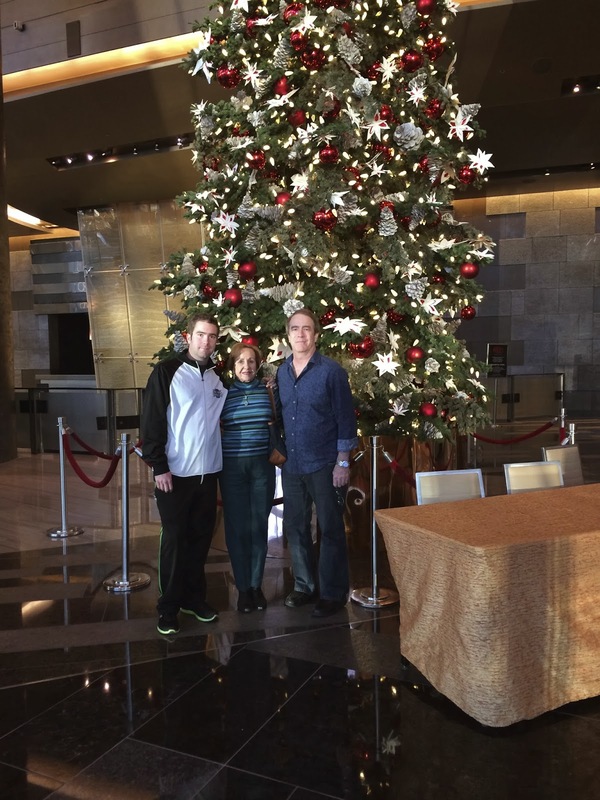 My next trip report I'm staying at Aria and attending their private New Year's Eve party! Thanks Tim. I'm going to Vegas next month and hoping to have some big wins like you just did! Cute pics of your son & Mom! Great trip report! I really enjoyed reading about your time in Vegas.I thought going every 6 weeks was a lot but you seem to go more often.Good for you.I love Vegas.I'm going the first week of February so maybe I will see you there.And if not good luck. Hi Kira, I'm glad you enjoy reading my trip reports. I'll be in Vegas for 4 nights starting Feb 10th, if you are there at that time you might spot me at Cosmo on the 8th and 9th and Venetian/Palazzo on the 10th and 11th. Good luck on your trip, I hope you have lots of wins and fun! 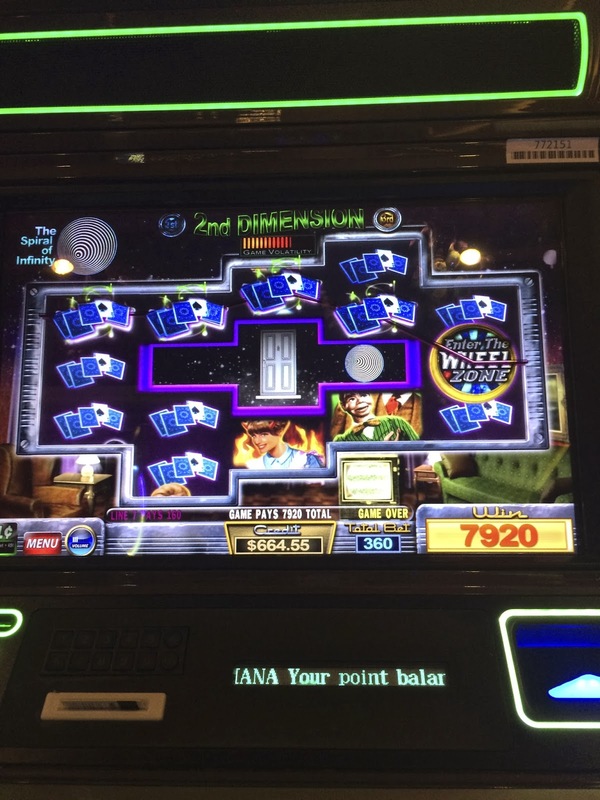 Hey Diana....save some of that loot for April and we''ll do the quick hits high limit LOL...CONGRATS!! Thanks Mike. Sure we can walk over from Wynn and try out luck at $1 Quick Hits if we have any bank roll left at that point, LOL! Hi Diana- Thanks so much for another great report. Looks like you had a wonderful time. 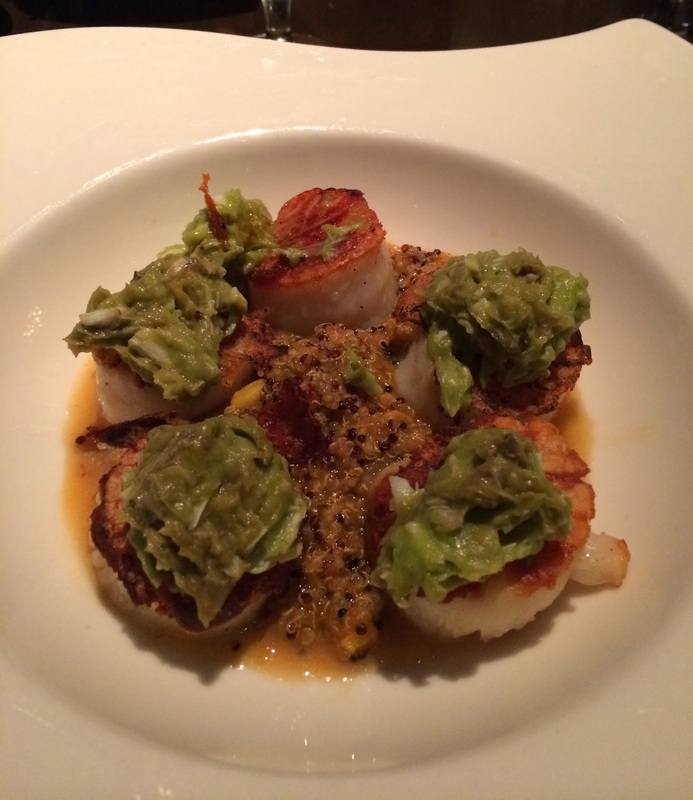 We've added a couple more restaurants we were considering to our list, based on your review. Glad you like MJ ONE as well as we'll be seeing it this weekend. Some nice wins you had there and best of luck when you go next month!